Honestly, I have been searching for over three years to find this, but it was so worth the wait. 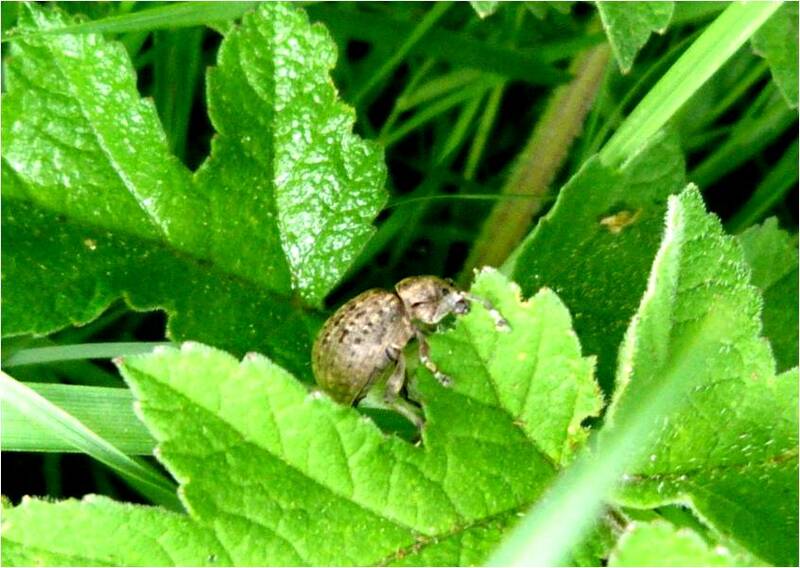 I spotted this creature walking up a pathway, but each time I approached it, it would fly a short distance into the grass beside the path or further up the path. 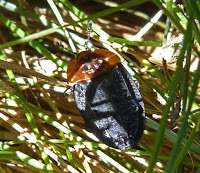 It is a large beetle and didn't fly very far each time, but it made an incredibly loud buzzing noise when it did so. So I kept following it up the pathway and eventually it decided to stop and sun itself at which point I snapped away like crazy. It was absolutely stunning in the flesh, even more beautiful than I could capture here. 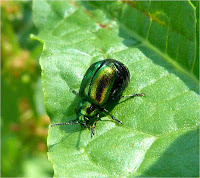 Its thorax was quite literally shimmering in the sunlight, beautiful iridescent greens and purples. And the yellow spots on its elytra (wing cases) make this one of the most easily recognisable and incredibly exotic insects of them all. Its larvae live in vertical tunnels in the soil with their jaws at the surface waiting for prey (see photo below for larvae holes). It has a huge yellow and fearsome mouthpart (again see below) which I was only able to photograph because the insect was dead - poor sole, so it's probably not exactly how it would look on a living tiger beetle, but you get the idea. A distinctive brown beetle with lilac coloured 'spots' on its elytra (wing cases). 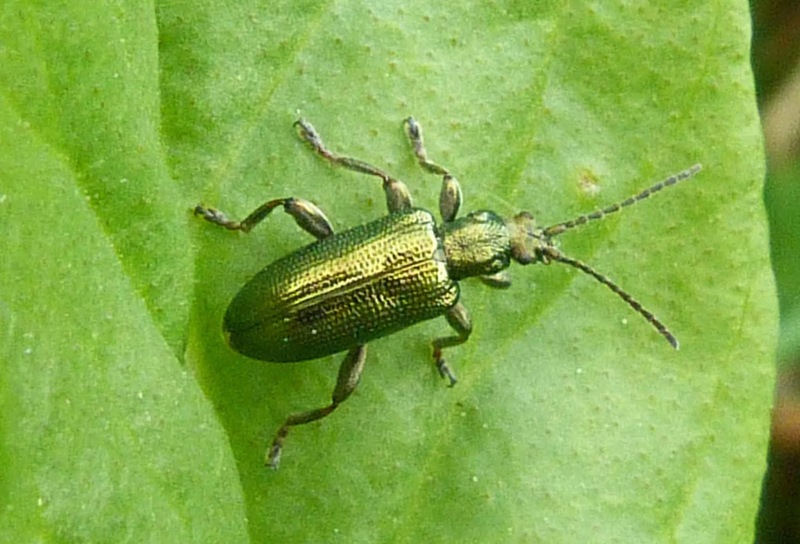 It looks very similar to Elaphurs riparius, but that beetle is green in colour rather than brown. This was found roaming around in the mud beside a pond and stream. I had to follow it around for about 15 minutes before it stopped for a rest, and even when it did finally stop, it didn't do so for very long, so I was pretty pleased to get this photo, even though it's not brilliantly sharp. 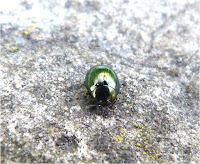 I apparently loves the sun and is supposed to have bluish metallic legs, although that isn't obvious from this photo. One of my favourite photos as you can see the dor beetle's clubbed antennae, its gooved elytron (wing case), the metallic bluish tinge to it and the drops of rain on it quite clearly. 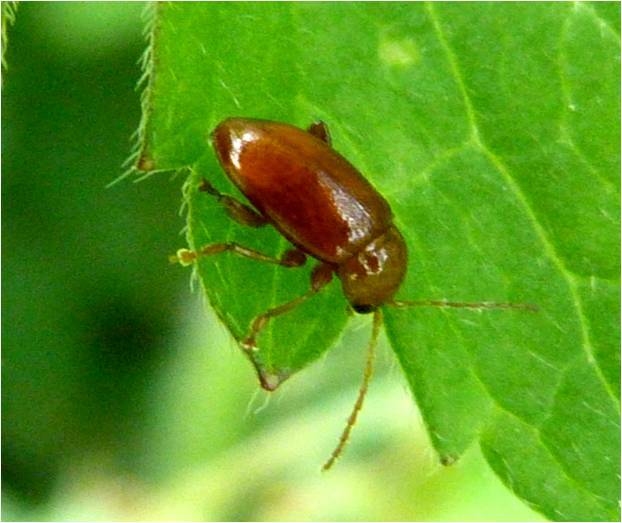 It is a very common beetle which breeds and digs tunnels in dung. The metallic blue is even more obvious on the beetle's underside, as can be seen from this, sadly deceased, dor beetle on the right. 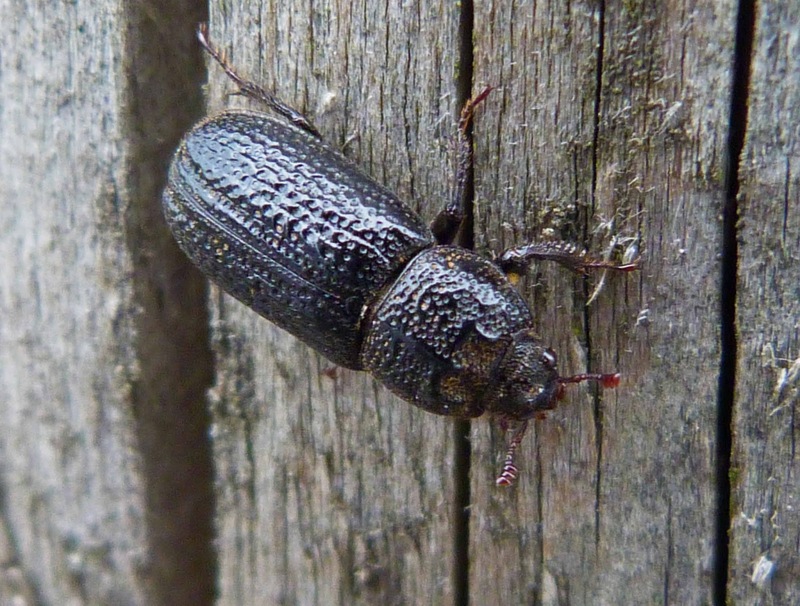 This is a large beetle about 1.5cms long with very pitted elytra (wing cases) and pronotum (bit behind the head). Its antennae are a reddish colour with a fan like structure at the end of them. 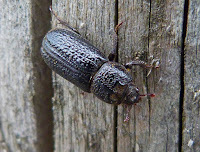 This was found on a wooden post quite late in the evening after most of the other insects had gone to bed. Although this is a stunning beetle, where there is a female there must surely be a male and I now want to go back and find a male as it has a large rhinoceros-like curved horn on its head. Thanks once again to http://www.ispotnature.org for helping me to identify this beetle quicker than I could blink. 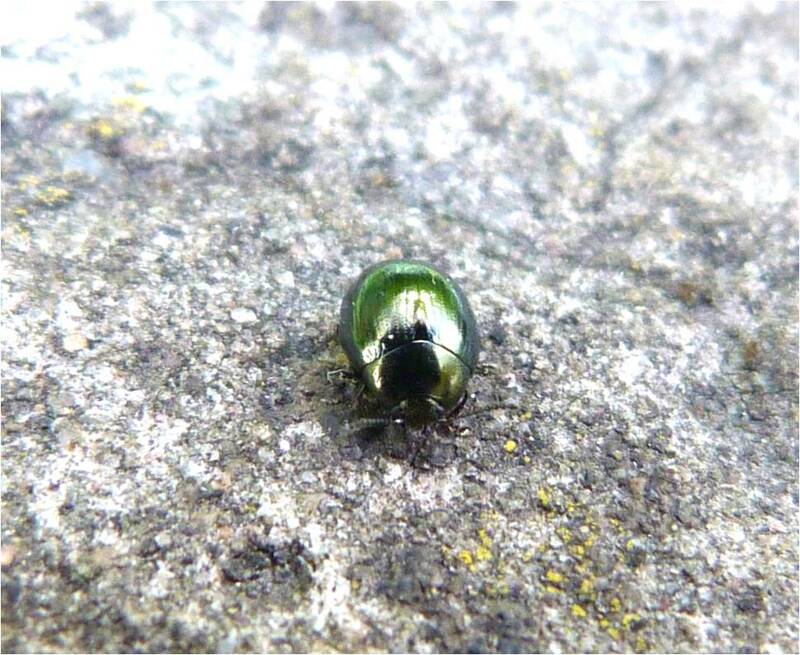 This beetle was found dead on a tennis court I was playing on, although I put it on a leaf to make it look a little more authentic. 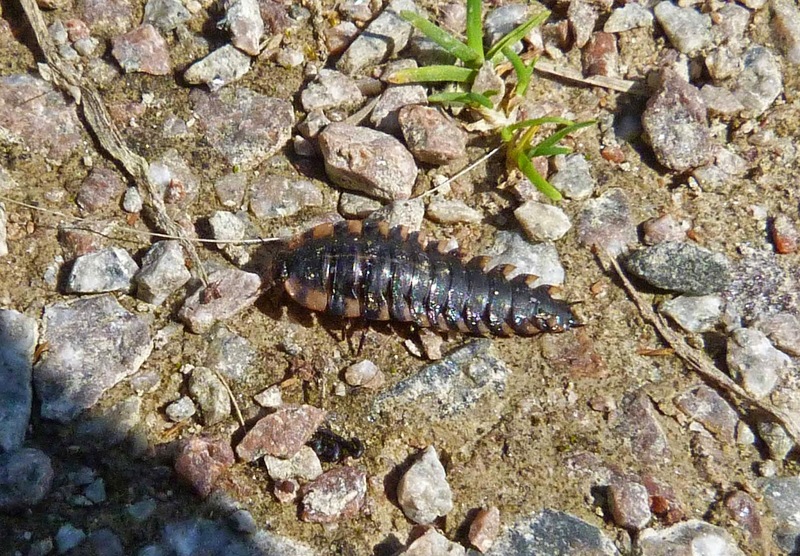 I had seen one alive previously, but it burrowed into the ground before I could get a decent photo of it. 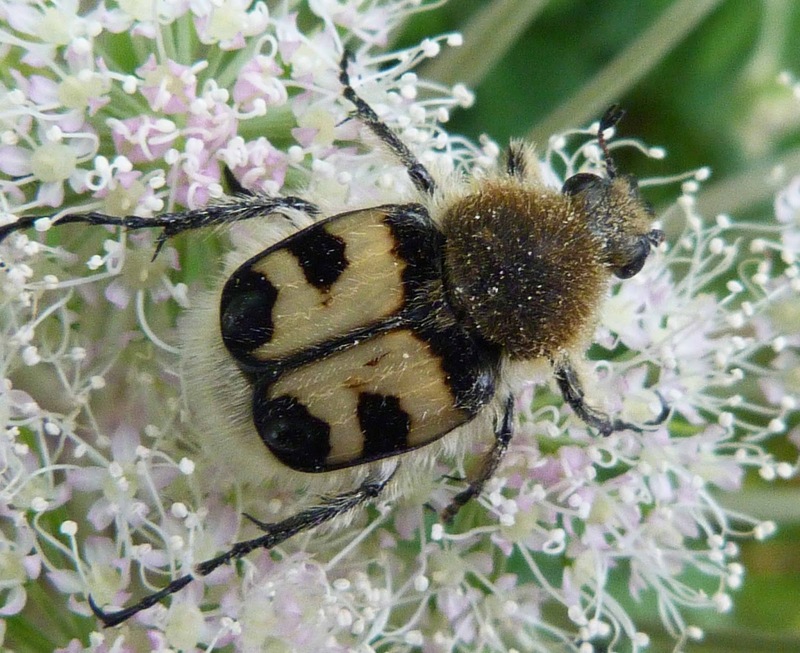 Firstly, as you can see, it is an absolutely stunning insect - shiny black with these bright orange stripes as if they've been painted on with someone with a shaky hand. 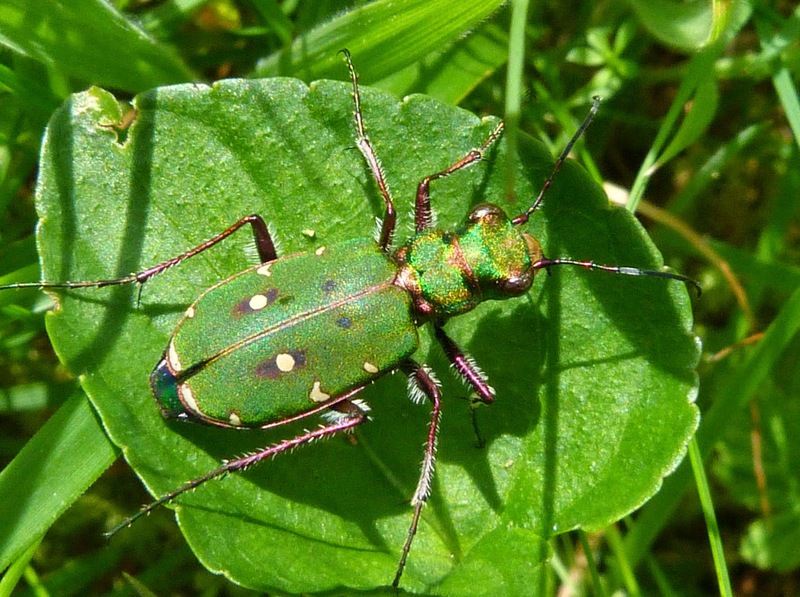 But these are amazing insects in more than looks alone. These beetles are vital in disposing of dead carcasses. 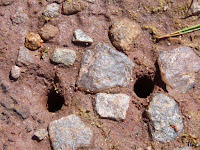 They burrow beneath the carcass and bury it beneath the ground. We have a lot to be thankful to these guys. Having said that, this beetle was covered in tiny orange mites and when I look at other photos of this beetle (dead or alive) they are also covered in mites. Guess that's what you get if you spend your days rummaging around dead animals. 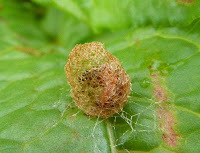 I thought this would be the easiest thing in the world to identify, but it took me ages to work out what this was. 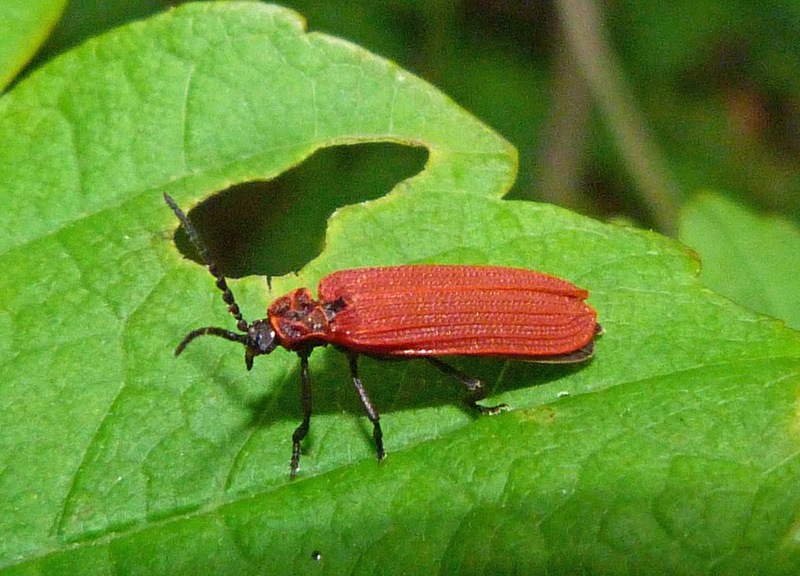 At first I thought it was some sort of cardinal beetle, but the elytra (wing cases) of cardinal beetles don't have the striking raised lines and pitted appearance of these appropriately named net-winged beetles. 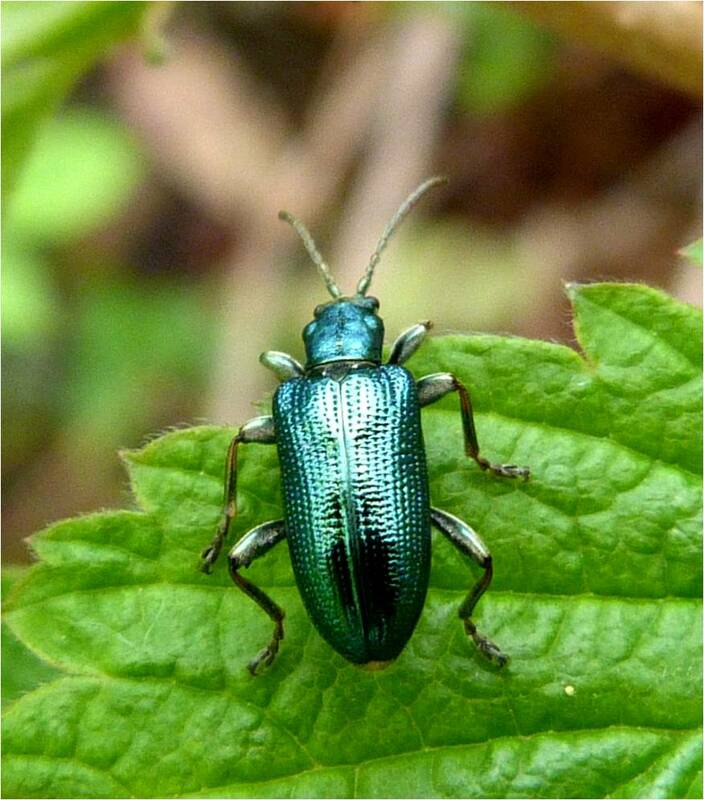 I had to take these photos with a flash as it was sitting in shaded woodland margins quite late into the evening, which I think is fairly typical of these beetles. I also notice that the wing-cases are sitting slightly apart and this also seems to be quite typical of these beetles. Anyway, it's obviously bright red and has what looks like 5 strange dark smudges indented into its pronotum (the bit behind the head). But the most exciting piece of information about this particular species of net-winged beetle is that in the UK, it can only be found in Scotland. Hurray! 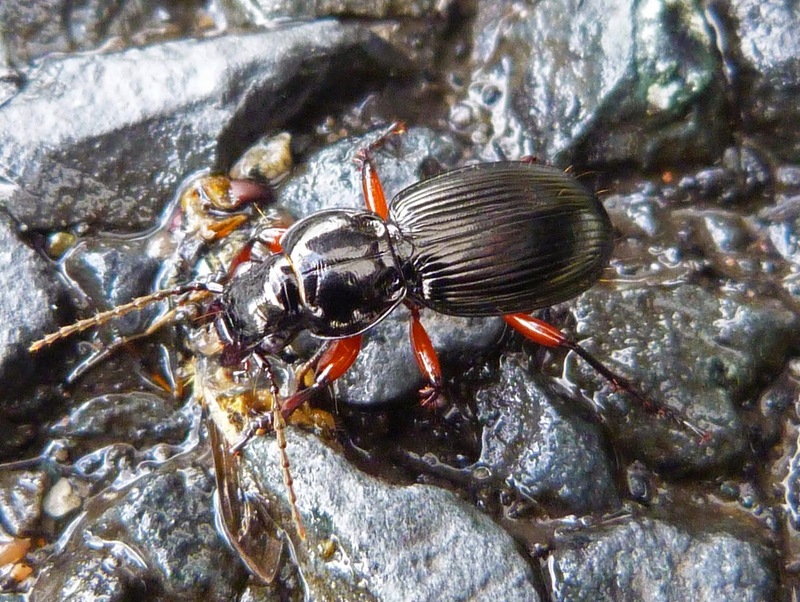 This shiny black beetle can have all black legs, or striking red legs (variety concinnus) as the beetle has in this photo. 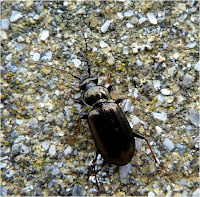 It is a large flightless beetle that is widespread and can be found in gardens and fields, or in this case in the middle of the road. 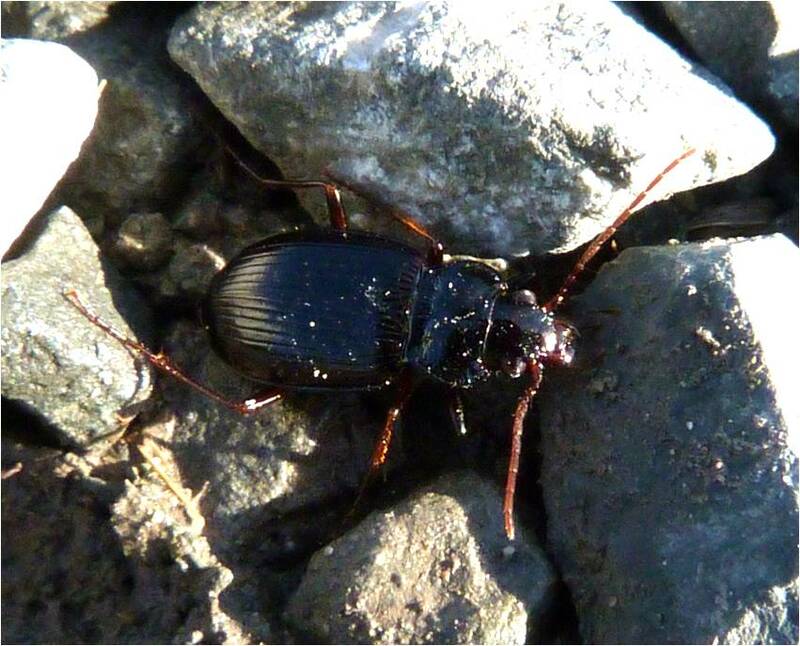 There are apparently over 1,000 species of Pterostichus. 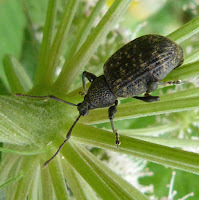 Another fact you may find interesting is that I now have to bribe my children to come insect hunting with me and my son therefore received the overly-generous sum of £2 for finding this one. This hobby is becoming more costly than I had originally anticipated. 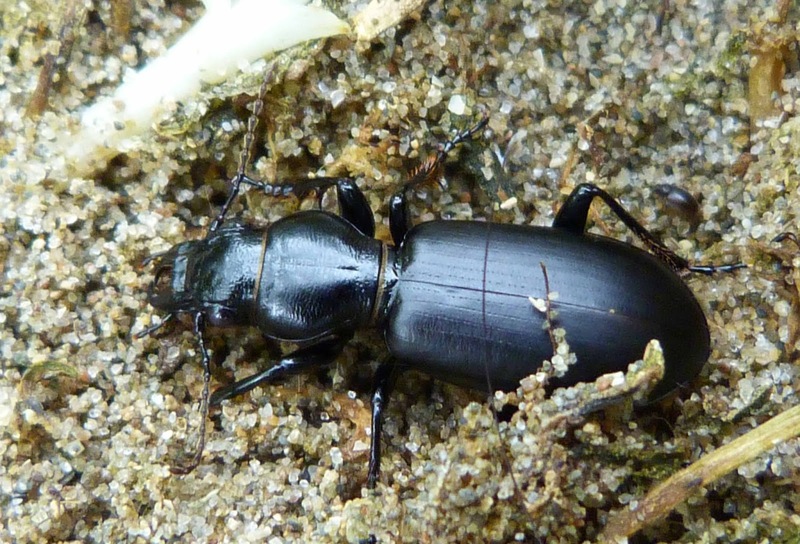 This is a large beetle, in the region of 1.5 cms long and two of them were found under a large stone on the beach. 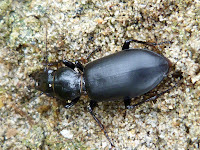 The elytra (wing cases) are quite smooth compared with many ground beetles, with little pitting and/or grooves. 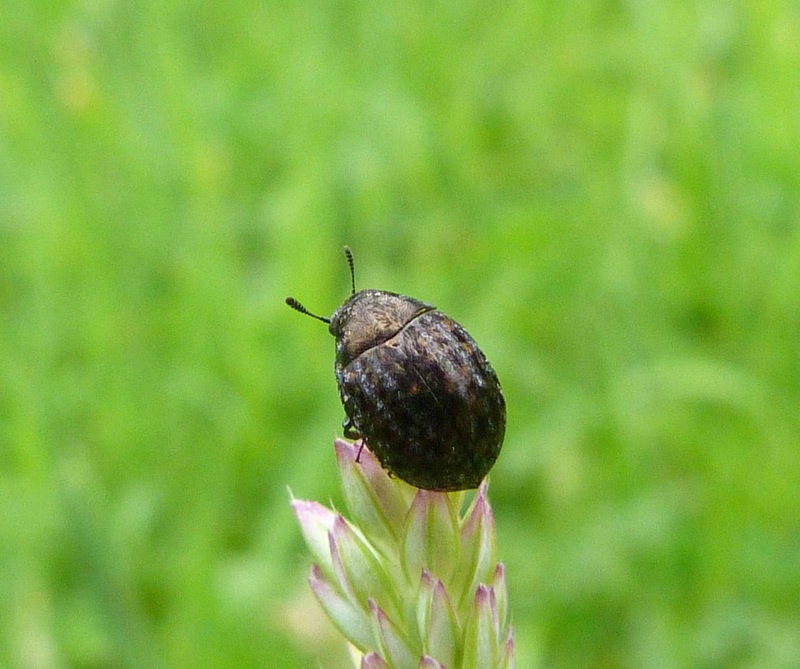 The pronotum (the bit behind the head) of this species also narrows in to the body noticeably. I really struggled to identify this one, so many thanks to http://www.ispotnature.org for helping me to identify this beetle almost quicker than I could upload it to their site. This is a medium sized common beetle that I found crawling up this pebble dashed wall. 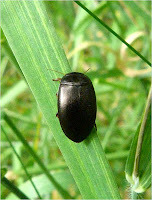 It is all black except for its anntenae and bottom part of its legs which are brown (can be seen here if you look closely). 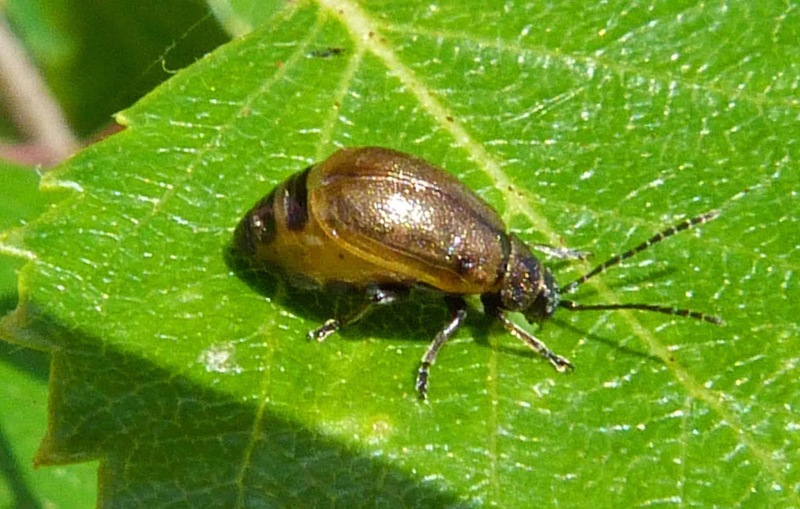 Immature adults are a light brown colour. 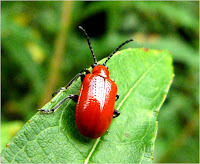 To my mind, the most distinguishing feature is the conspicuous rounded pronotum. 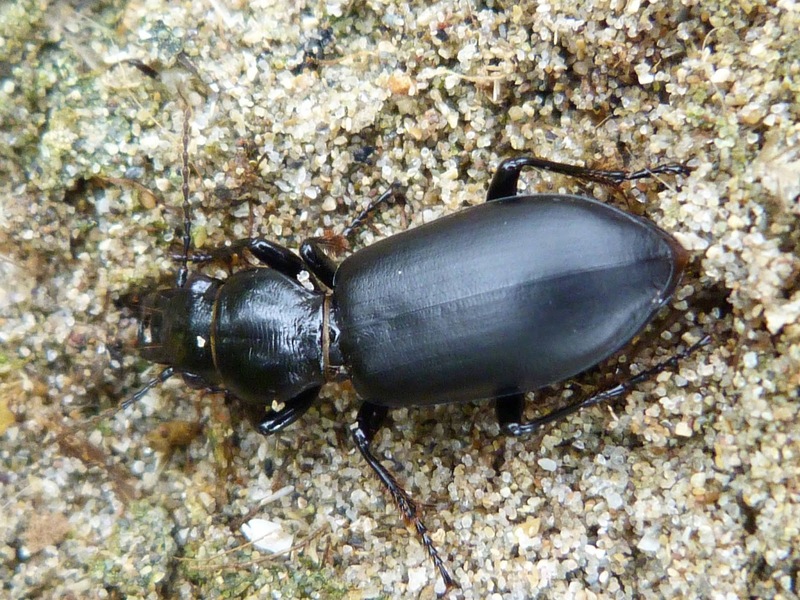 Supposedly, this is the most common ground beetle in London – but we don’t need to know that as this website is only about Scottish insects….! A black shiny beetle with brown legs and antennae. 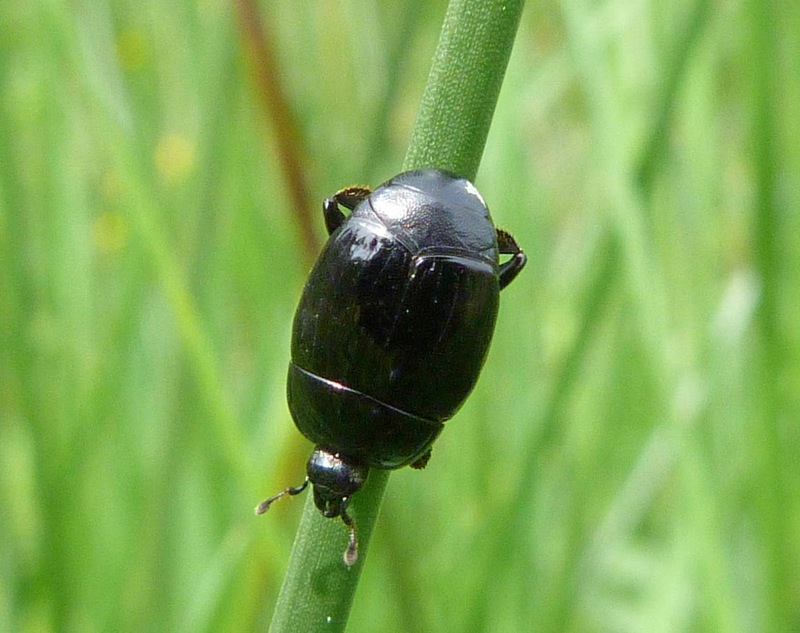 It is very similar to a number of other beetles, and Leistus fulvibarbis in particular, but this beetle’s pronotum is more uniformly broad than other similar species. 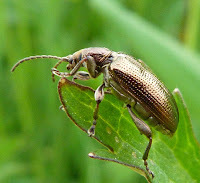 These beetles can move incredibly quickly and getting a good shot of this was always going to be well neigh impossible. 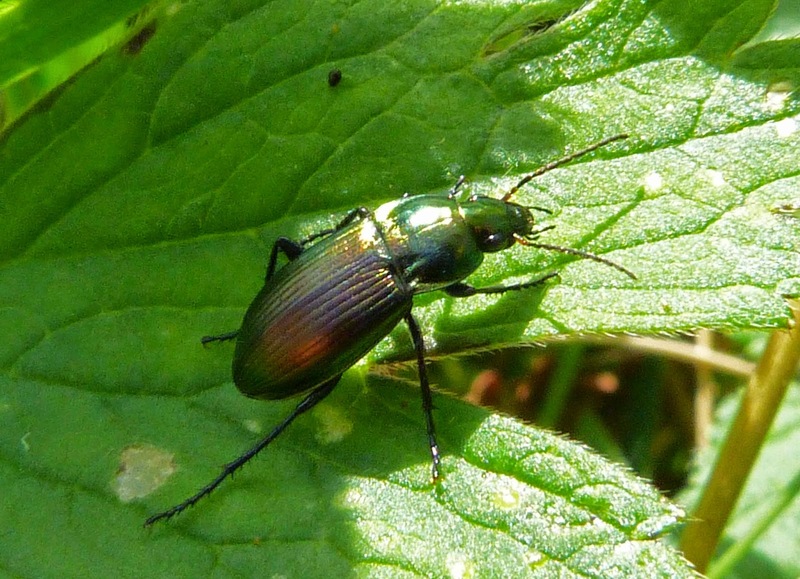 Whilst many of the ground beetles are difficult to identify, this one is rather easier to recognise and identify due to its copper coloured 'body' and metallic green head and pronotum (the bit behind the head). 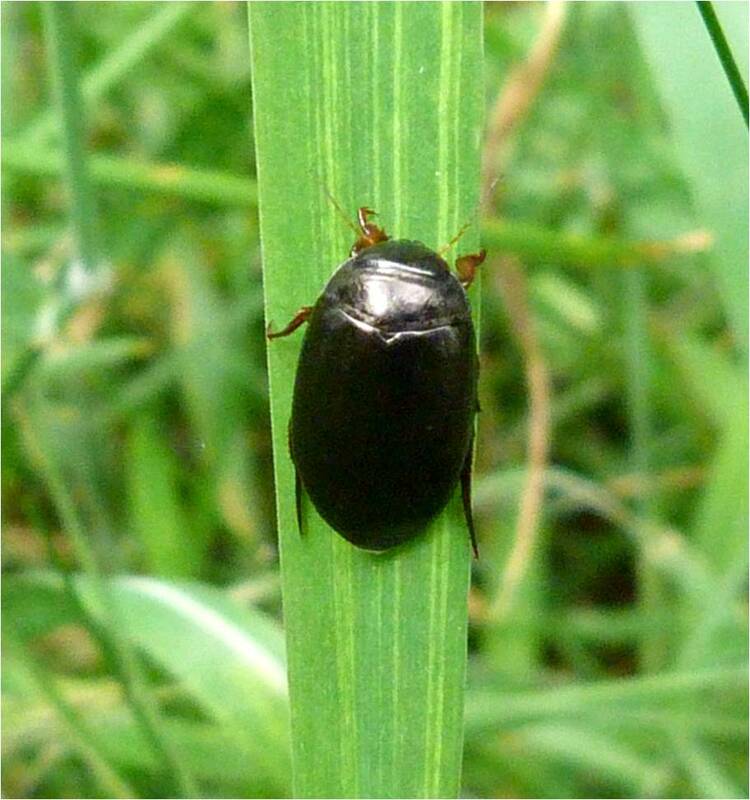 It seems from all the sources I've read, that this beetle only lives in England, but as you can see, I found this one on the isle of Mull. 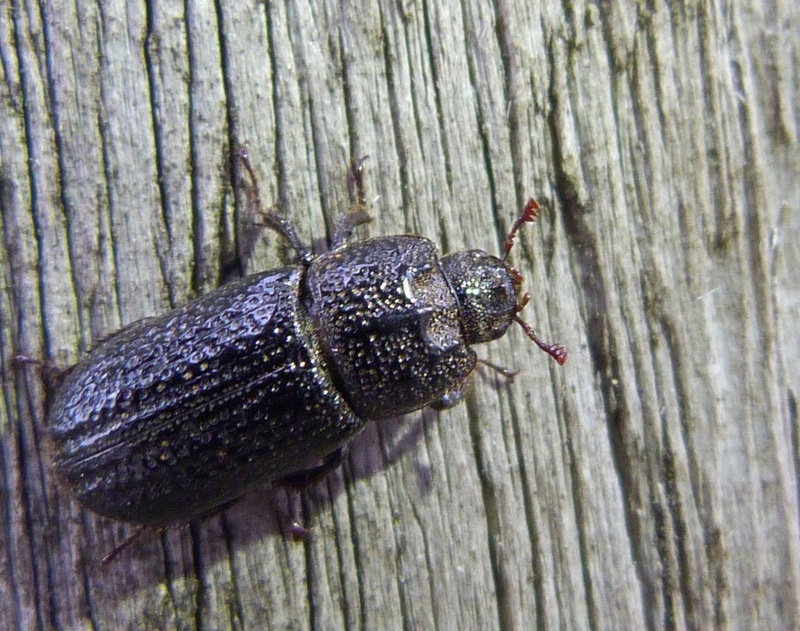 Whether these beetles have moved further north in general, or this is a lone beetle that has come across the sea on a camper van, and is about to die of cold, is hard to know, but I am delighted to have found this rather stunning creature. 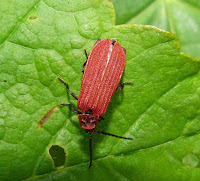 The name sexpunctatum refers to the six lines on each elytron (wing case). 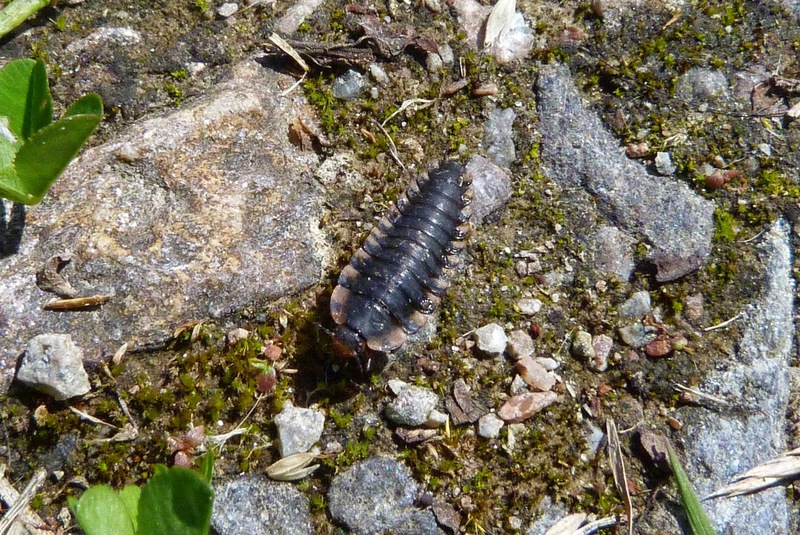 I confess that I didn't make much of an effort to get a good photo of this as, firstly, it was moving far too quickly and secondly, I thought it was some sort of strange woodlouse or other non-insect arthropod because it had so many 'legs'. It was only when I saw a photo of a glow-worm larva that I thought this didn't look a million miles from it. 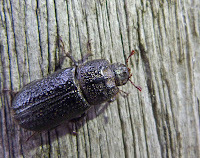 It seems like many carrion beetle have this armoured look and in fact, on better photos than these, you can see its six legs beneath its body. 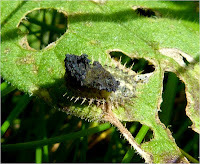 It is a pretty dramatic looking larva. 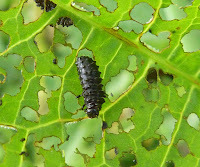 The adults are shiny black ridged beetles and both the larvae and the adults feed on snails. 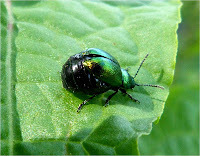 Beautiful metallic green iridescent beetle which sometimes has a bluish, reddish-purple or golden sheen (see photo on right). 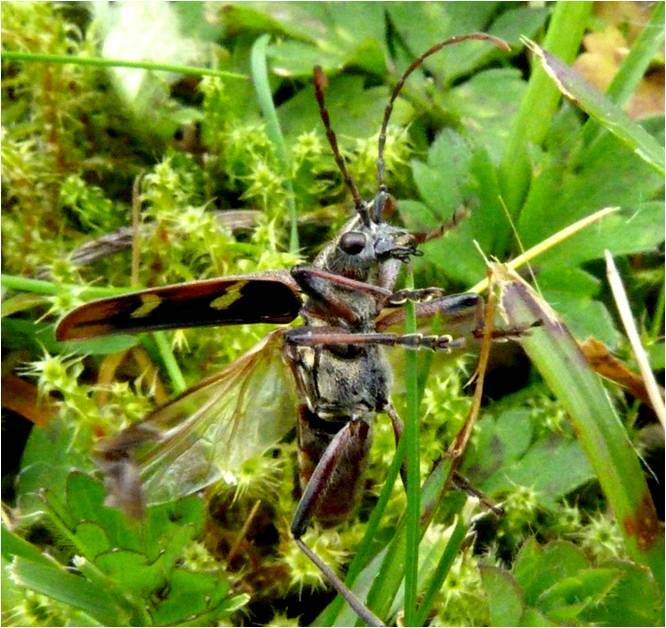 The females’ abdomens expand immensely when pregnant (see photos below).Their antennae are notched. They also are often found near water. 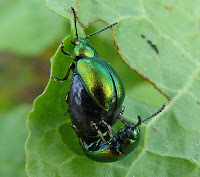 It is also known as the green dock beetle because of its penchant for dock leaves – hence the lumps taken out of the one in the photo on the left. 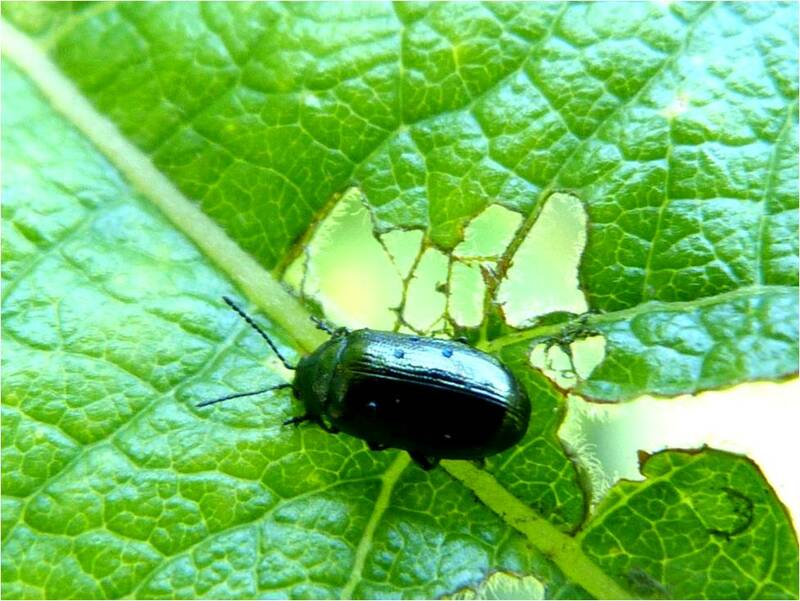 There’s no mistaking the delicate condition of the leaf beetle in these photos. Her abdomen swells up so much that it bursts out of its elytra. This does not look at all comfortable for the poor wee thing. 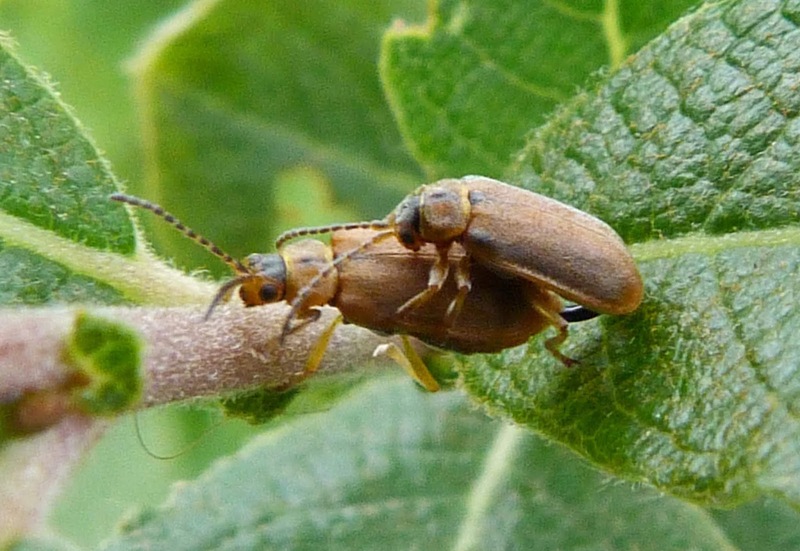 And for some reason, there often seems to be a male mating with the pregnant female (bottom photo) - in fact whenever I've seen these beetles mating, which is often, the female always looks pregnant, which seems a little peculiar to me. Why would a pregnant female mate? Perhaps someone can enlighten me as to why that may be. 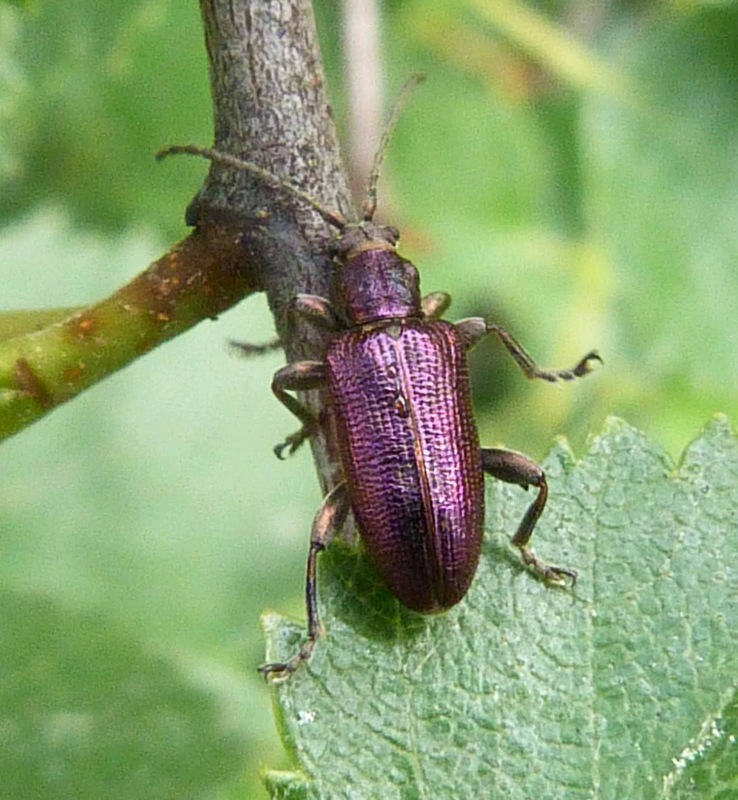 These beetles often have a beautiful reddish/purplish sheen, particularly in the sunshine, as can be seen in the photos above. Not terribly sharp photos I'm afraid, but the sun was beginning to go down and I always find it difficult to get sharp photos when the light dims. As the name suggests, they occur on mints. 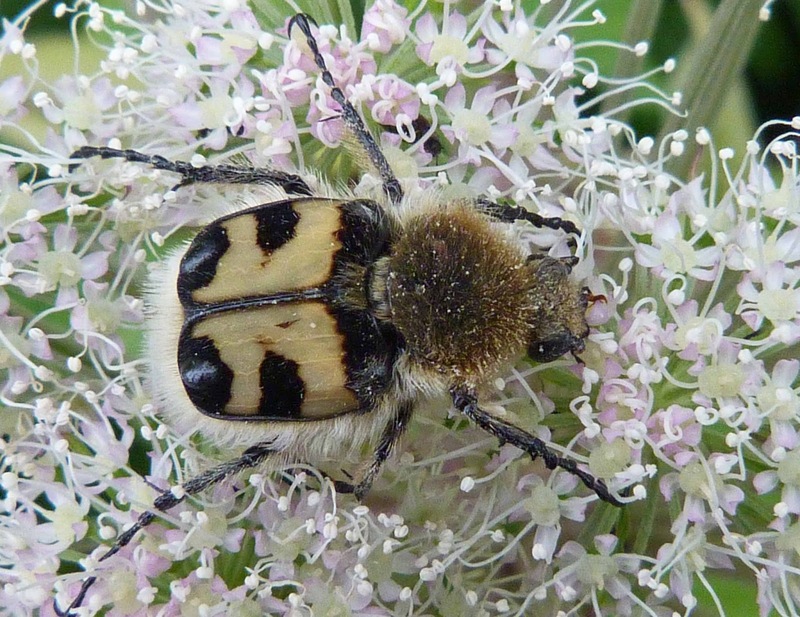 At first I thought this was a garden chafer (see below), but this doesn't have the fan-like flaps at the end of its antennae as chafer's do. 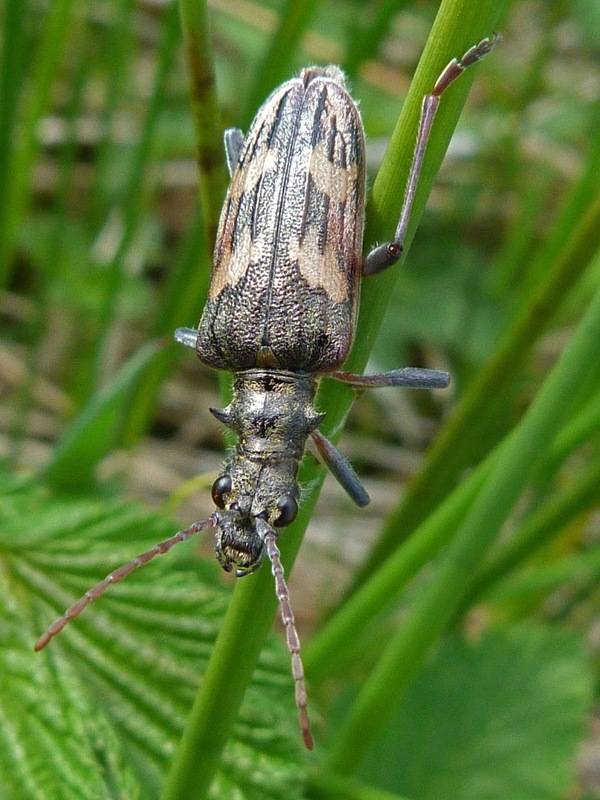 The pronotum (the bit behind the head) is a lovely metallic green and the wing cases are this brown colour, although they can also be bright red. 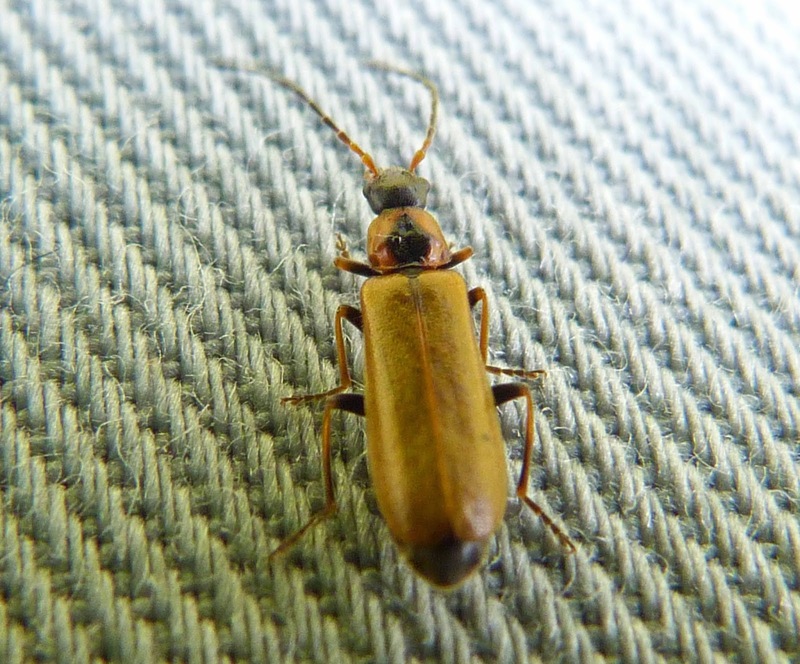 This beetle took fright when my camera came too close to it. It took fright, and 'played possum' - in other words it played dead. They do this as a protective mechanism when they think they're being threatened as most predators only attack live pry. 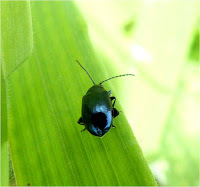 I'd like to point out that firstly, this leaf beetle should have known that I love insects and was never going to hurt it, and secondly, does it think I'm daft - it was walking along quite merrily when it suddenly froze and rolled over - really?! Anyway, I felt bad for the poor wee thing - took a quick photo of it playing dead, then left it alone - promise. 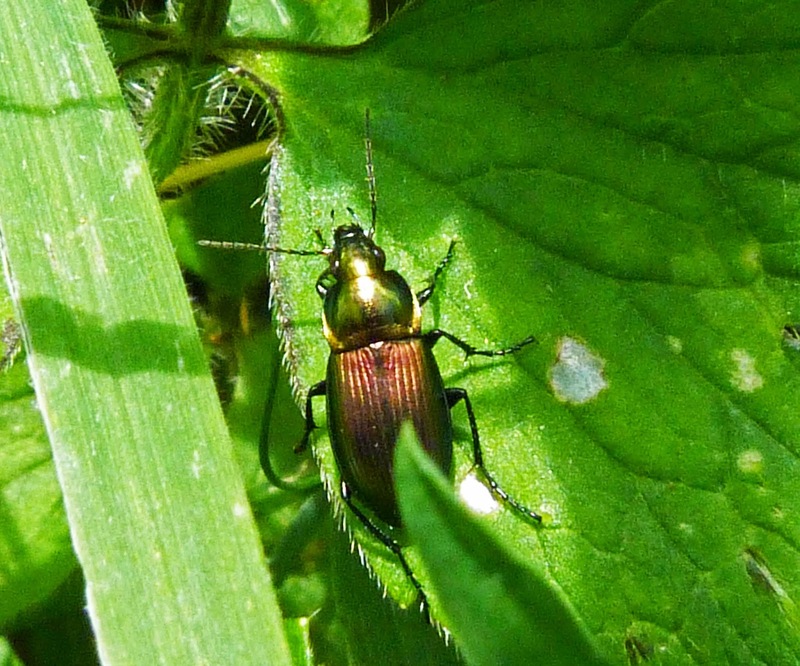 The metallic green body of this beetle was so shiny it glistened in the sunshine. 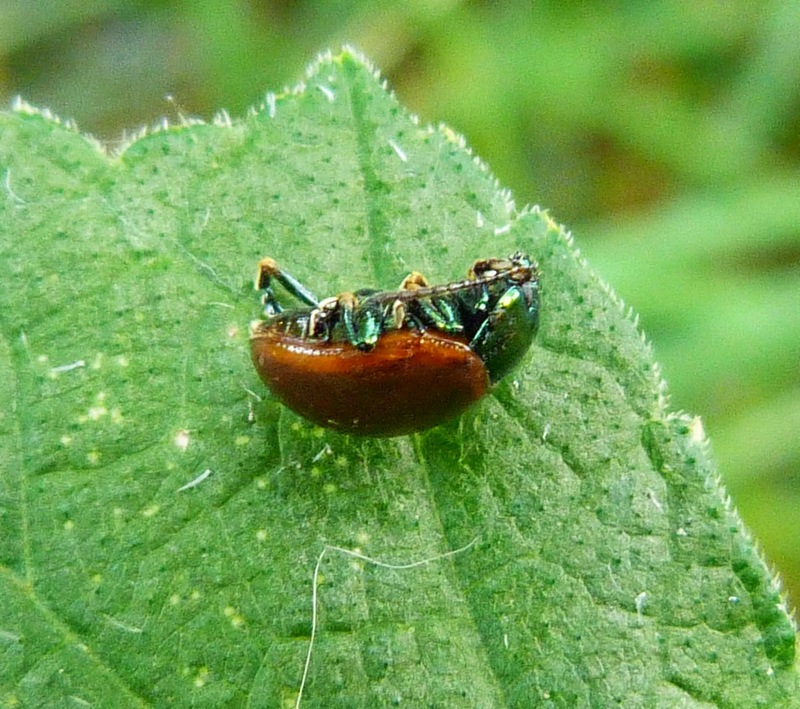 It looks like the head, thorax and abdomen are joined into one smooth jewel. 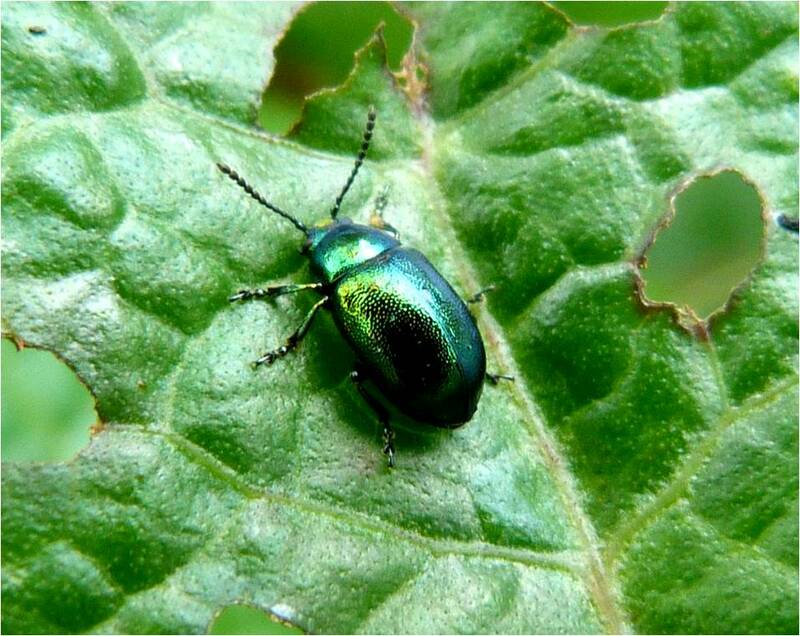 It’s a tiny leaf beetle. 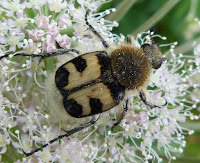 It seems that there are 4 species of this beetle in the British Isles. 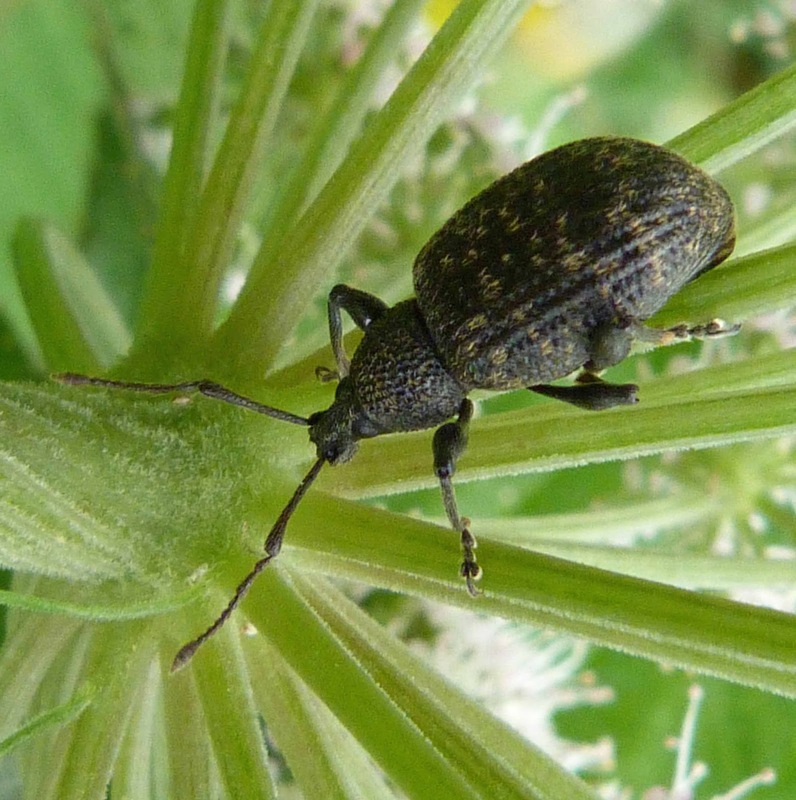 Thanks very much to Rob who blogged me correcting the identification of this beetle. This is also known as the blue willow beetle, although it can be black, bronze, blue or green. One of the best ways of identifying this leaf beetle, is to see the nasty mess it makes of the leaves. 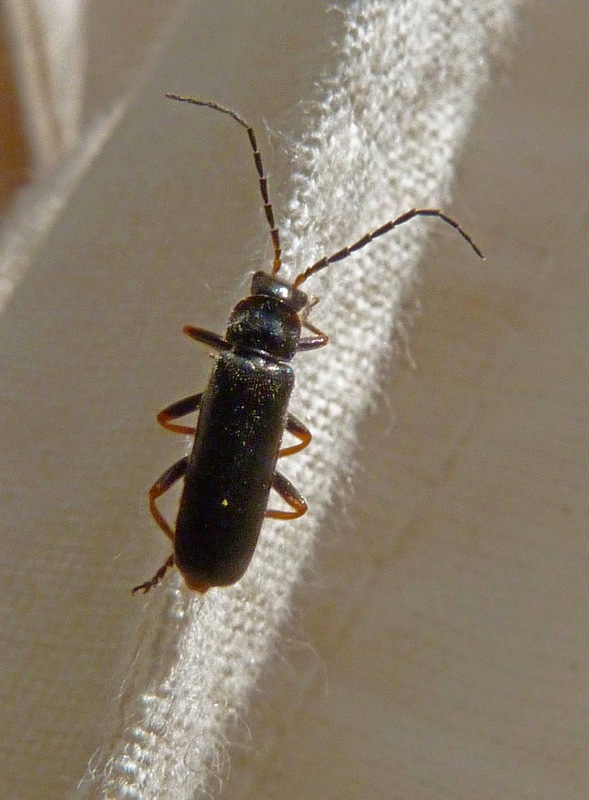 Although the picture quality is poor, this beetle seems to have ‘spots’ on its elytra which doesn’t seem to correspond with anything I can find on these insects. Can anyone help me with this? 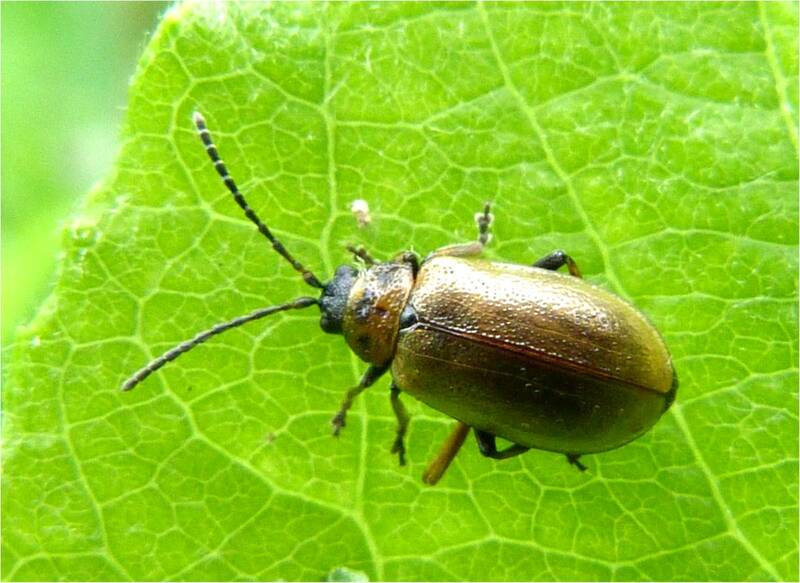 Not a particularly striking or memorable beetle this one. It is a light brown colour with pitted elytra and a slightly yellowish pronotum with three uneven black markings on it. 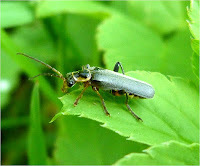 It also has with quite long antennae for its body size. 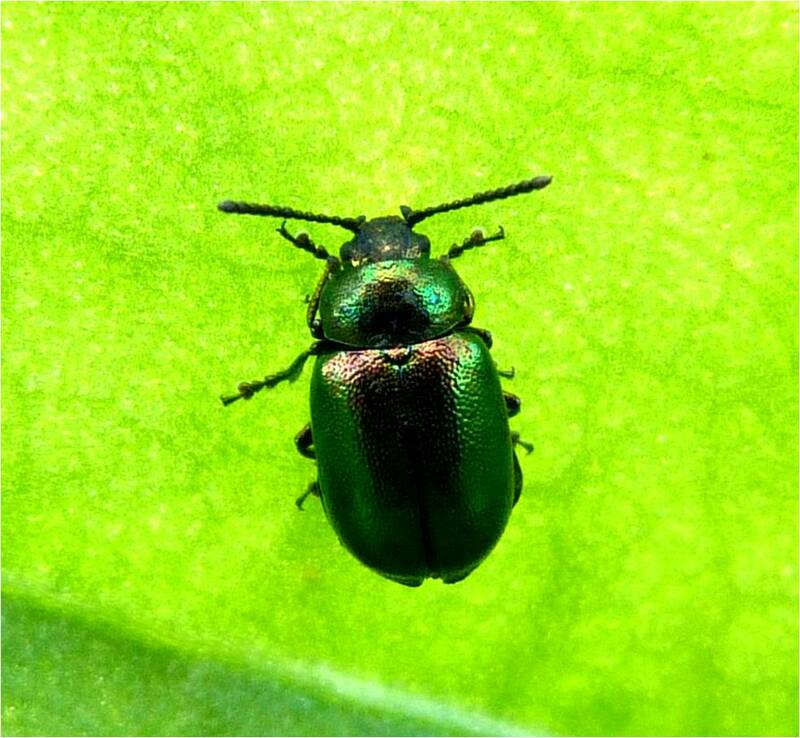 These beetle are can be commonly found in full view sitting on top of leaves , unlike many beetles which seem to like sheltering/concealing themselves under leaves. 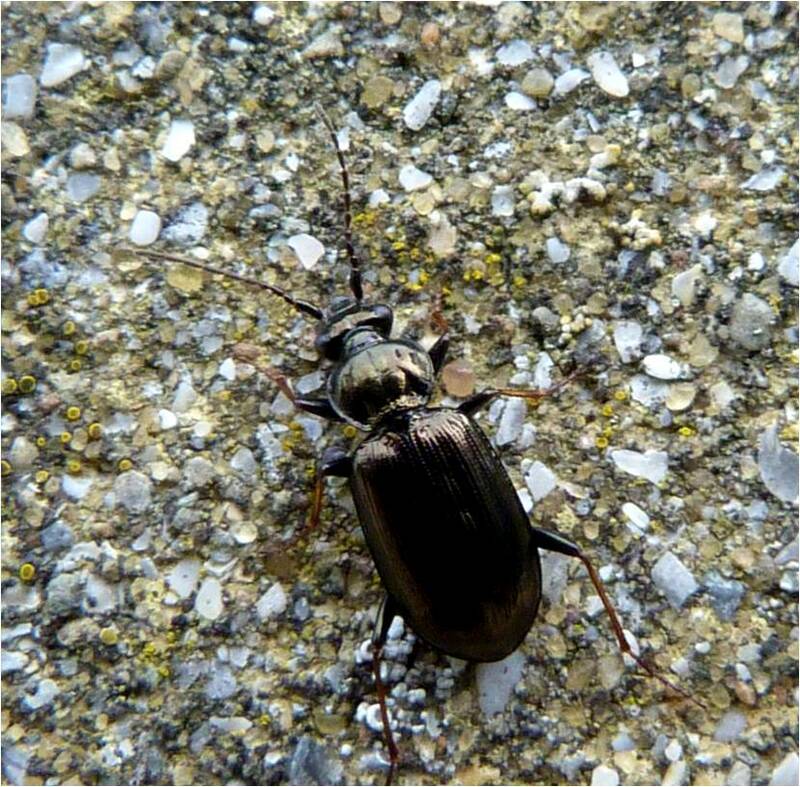 The beetle in the bottom left photo looks pregnant, but I can't seem to find anything to confirm this. 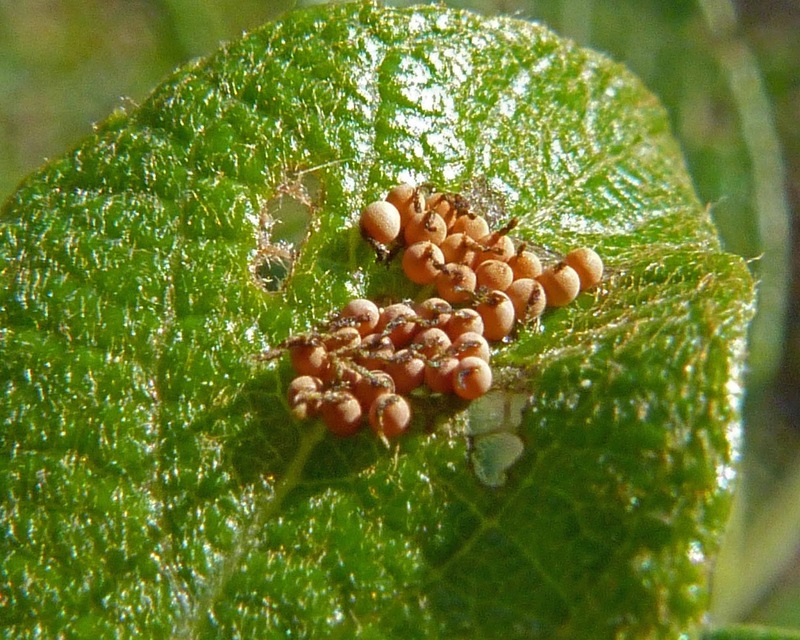 The eggs are interesting, as I thought they had been parasitised at first due to the worm-like protrusions coming out of them, but these are apparently typical willow leaf beetle eggs. It was really tricky trying to identify this, but I think it's a pill beetle of some sort. 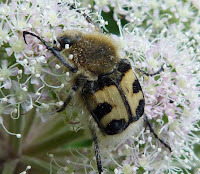 The markings are fairly distinctive with these dotted lines and the 'honey stick' shaped antennae. 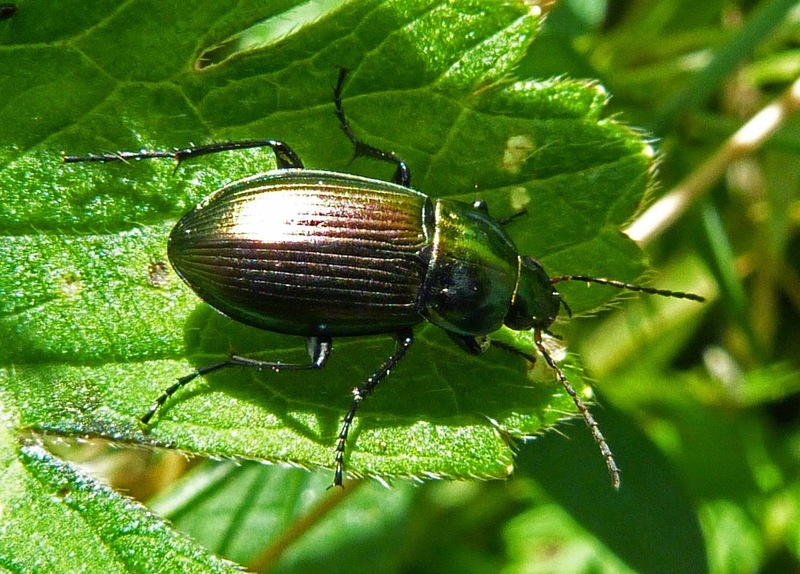 These beetles can often have a metallic greenish sheen to them, although it is not obvious from this photo. Apparently they are known as pill beetles because they can draw their legs and antennae in under them so that they look like a smooth 'pill' which they use as a defence mechanism against predators. These beetles move very slowly and are often seen feeding on mosses. If these really are the species I think they are, then it was no wonder I found it so difficult to identify (as usual, there are many similar species and I may not be right), as this species is 'colour polymorphic', in other words it occurs in many different colours across the spectrum from a very deep blue to red. 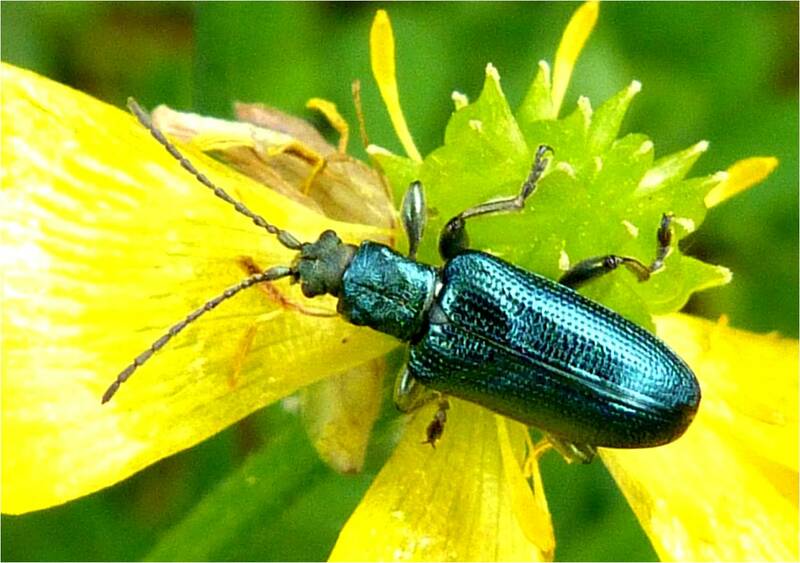 Whilst green, copper and brown seem to be popular, the bright blue ones on the second line looked stunning, particularly against the yellow buttercup. The one at the top is an amazing reddy-purple with a green thorax. 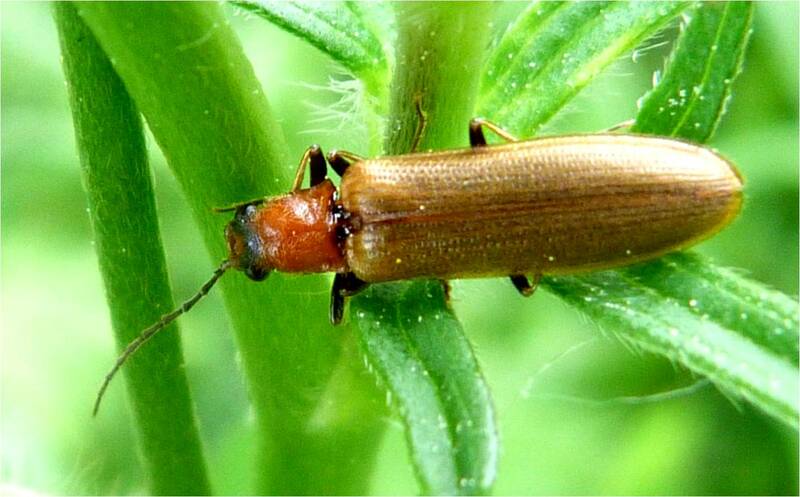 Reed beetles in general are often metallic. Other distinguishing features are the 'bumps' at either side of their thorax, their pitted elytra, long jagged antennae and their enlarged 'thighs'. The back thighs have a 'thorn' on each of them, which you may just be able to make out in some of the photos. Attractive metallic brown reed beetles found beside a country pond. 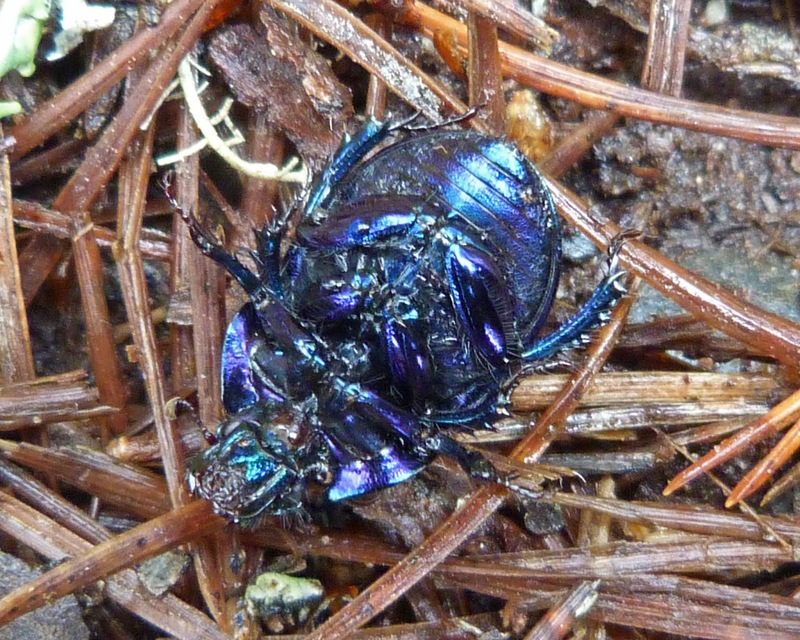 These beetles look rather flattened and their elytra (wing cases) are clearly pitted. 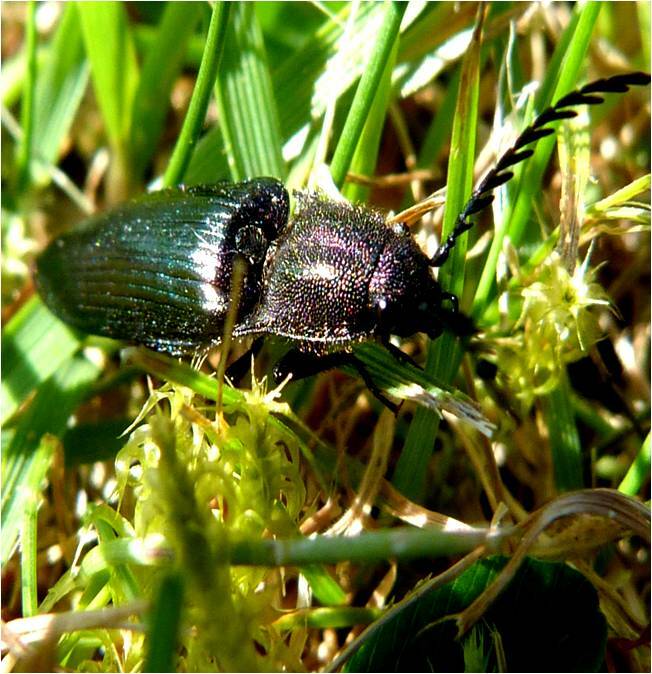 Both males and females are this colour, although the male often has a slightly greenish sheen. 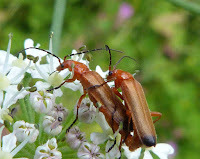 They are commonly seen mating on bur-reed - and this photo seems to tick both boxes. Although these are fairly commonly found in England, they are much rarer in Scotland, so I'm quite excited about having found these. A large shiny black beetle about 1cm long found in grasses beside a pond. I'm not sure why they're called clown beetles, but it's been suggested that their flattens legs look like a clowns - yeah, I wouldn't be convinced about that either. 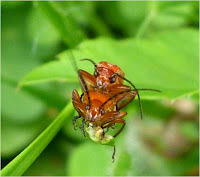 I do know that these beetles play possum (i.e. dead) when disturbed and are used by forensic scientists to help to determine a date of death. 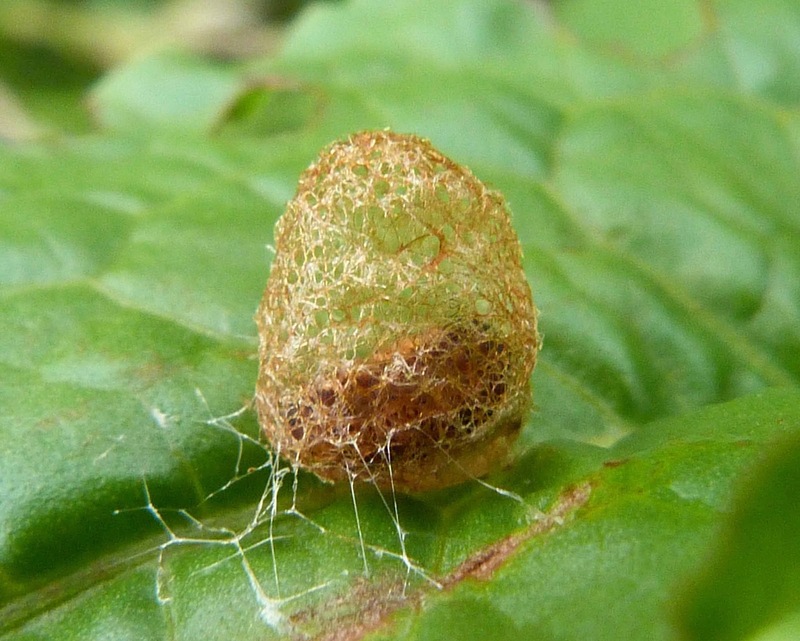 They don't actually eat the carrion, but lay their eggs in it - nice. 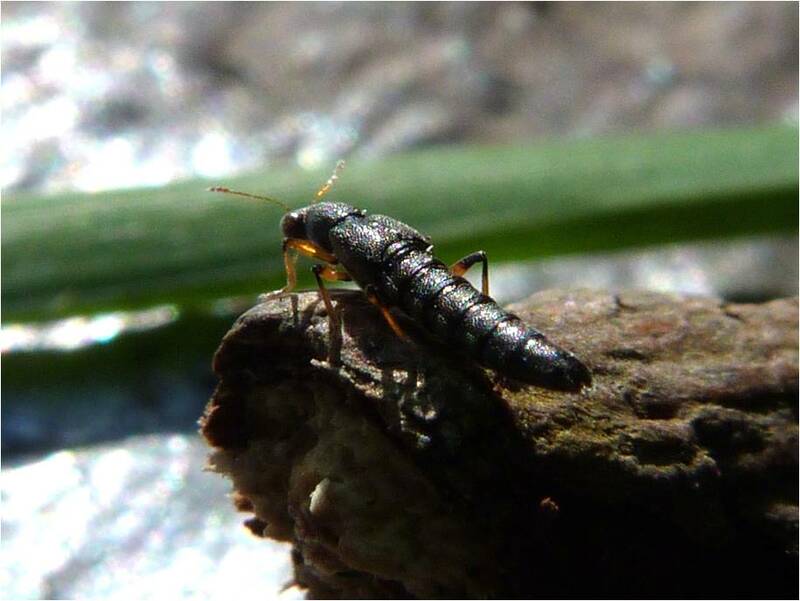 Thanks again to http://www.ispotnature.org for helping me with the identification of this one. This insect is virtually identical to Altica palustris and can only be distinguished by dissecting it – which of course, won’t be happening here! 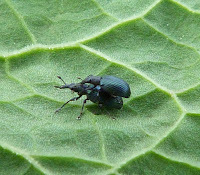 Given it’s called a flea beetle, it does jump, but not terribly willingly and not very far. It has this beautiful metallic blue sheen. 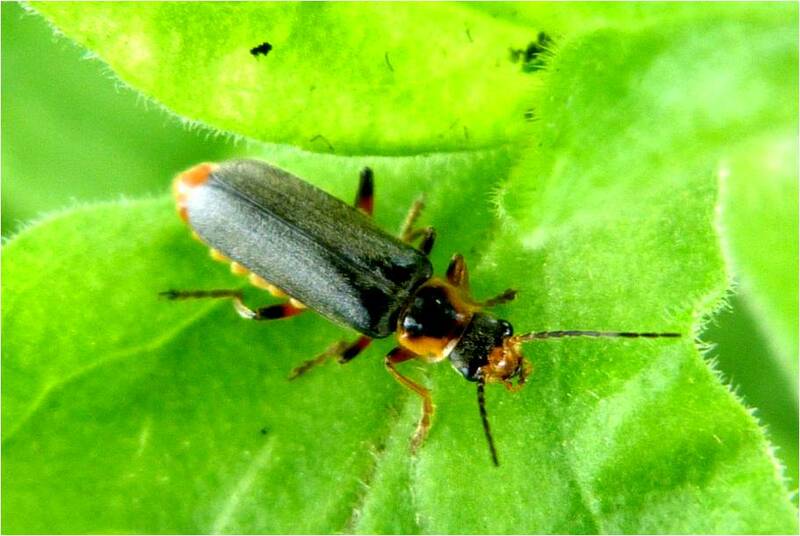 The orange-brown colouring of this flea beetle makes this insect fairly easy to identify. 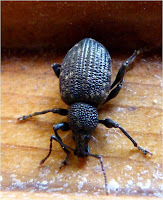 It doesn’t have a ‘neck’ which distinguishes it from the similar looking Neocrepidodera ferruginea, which does have a defined ‘neck’ (i.e. there is a gap between the head and the body). 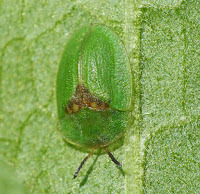 Another clear identifying feature of this insect is the deep transverse furrow on its pronotum. You can see the indendation in the photo on the left just in front of the wing cases. What you can’t see in these photos unfortunately is their large back legs which enable them to jump a fair distance when disturbed. Five years I've been waiting to see one of these!!! 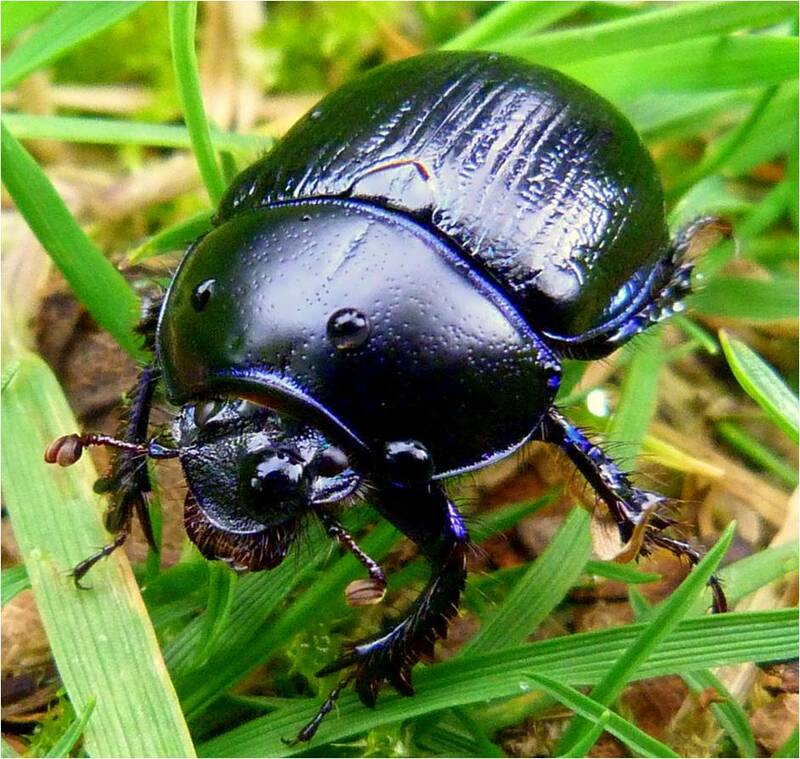 Can't believe I finally managed to find one and there it was beetling around my front porch one night when I got home late from work. 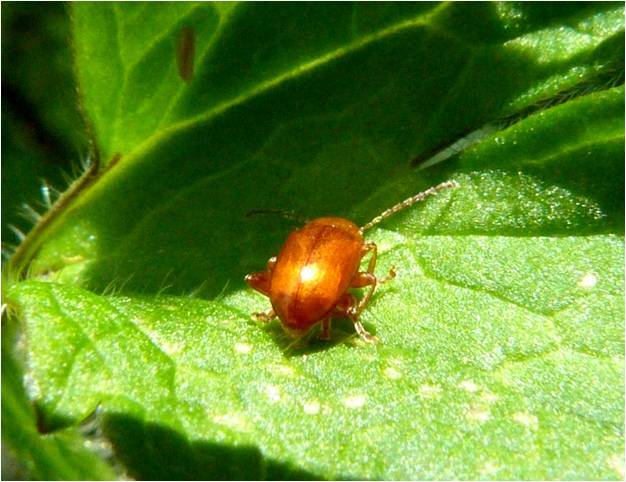 And that's probably why it's so hard to find - because they usually hide under leaves during the day and only come out generally at nighttime. And I was even more surprised to see it given it was mid September. 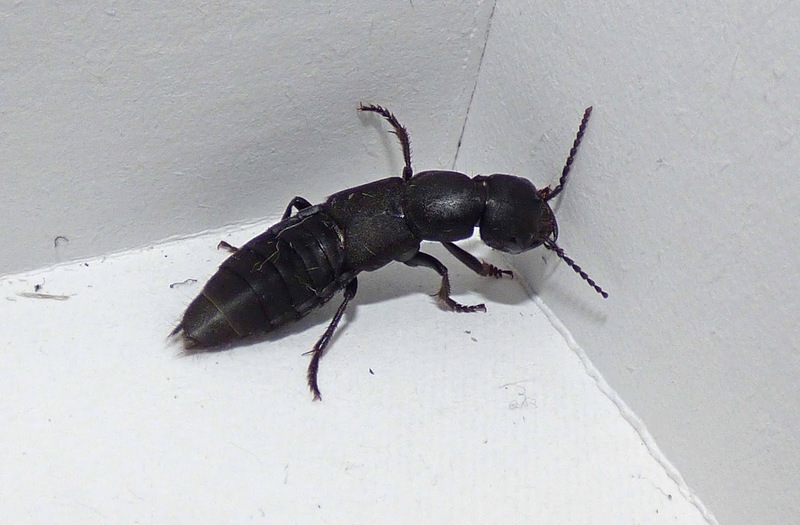 Anyway, in my introduction to this website, I said all insects had been photographed 'au natural' and they have been - except this one. Since it's taken me so long to find the thing and I couldn't photograph it outside in the dark (without the risk of losing it anyway) I brought it inside, placed it in a large shoebox and only returned it to the front porch after put I'd taken some photos of it. I can't pretend to feel bad about it. Look at this thing - it is absolutely stunning and definitely worth the wait. 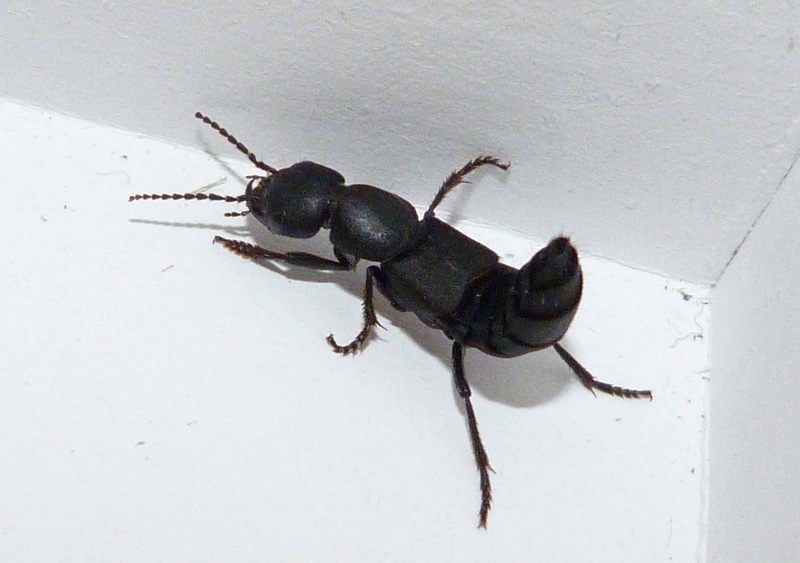 As you can also see, this is a big beast, about 2.5 - 3 cms long and is quite distinctive because of its length and because it is all black. You can see it here displaying the typical lifted 'tail' in defence and you can perhaps just about see it opening its jaws. And yes, since we're on a confession roll, I also confess to purposely irritating it, just to get its back up (wonder if this is where the expression comes from?!) 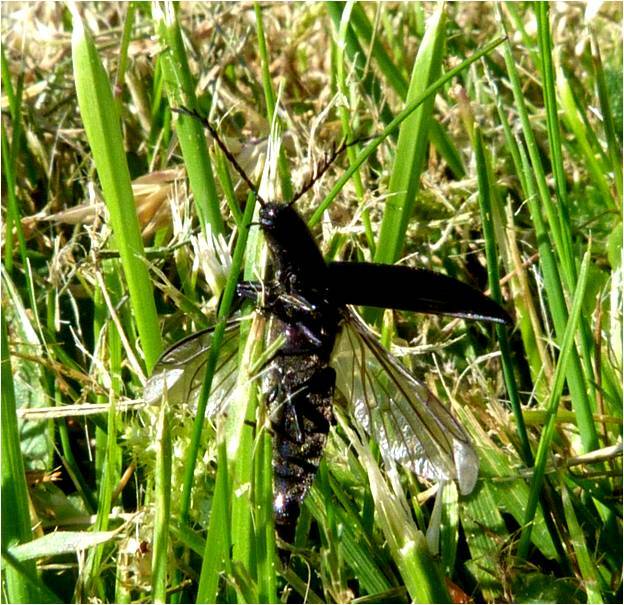 It is also covered in black hairs and can apparently fly, although it does so very rarely. Devil coach-horses are definitely not ones for picking up or prodding with your finger as they can inflict a nasty bite. 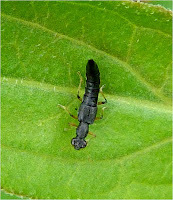 There are a number of species of rove beetle that look like this and it is impossible to identify the exact species from photographs alone. Rove beetles all seem to have this very distinctive, immediately recognisable shape. 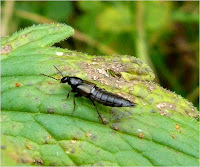 I haven’t managed to find the best known of the rove beetles yet – the devil’s coach horse, which I’m desperate to find. It’s a much larger version of this one, but they will all rear their tails up in the air if threatened. These rove beetles are all a shiny black colour, but with bronze-green wing cases which are very short. The abdomen is segmented and they also seem to have these tufts of hair protruding from their rear ends. This is an absolutely tiny insect. This rove beetle is standing on a twig and the green thing in the background is in fact a blade of grass! 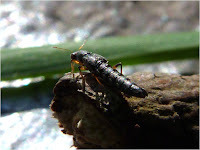 And as well as being minute, this insect scuttled about very quickly without tiring and without stopping, making trying to photograph it very frustrating. 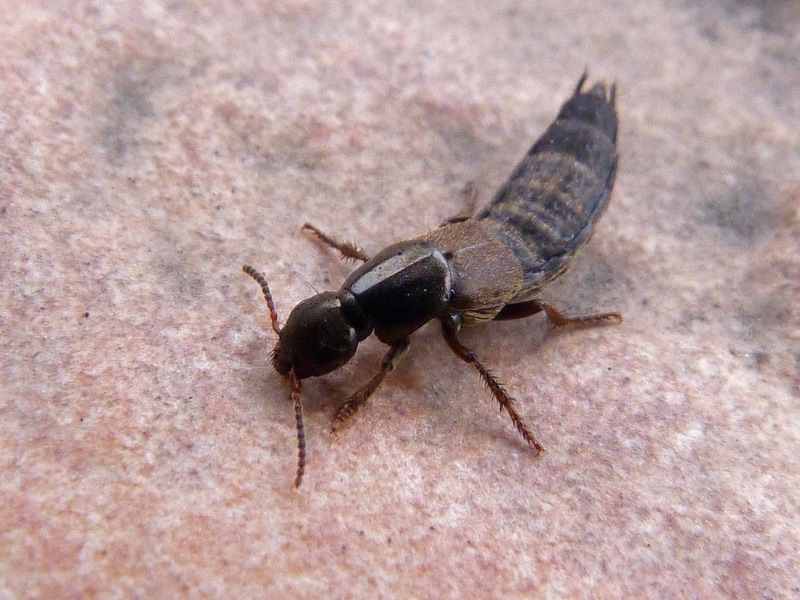 This rove beetle has large bulging eyes and a pitted thorax and abdomen. 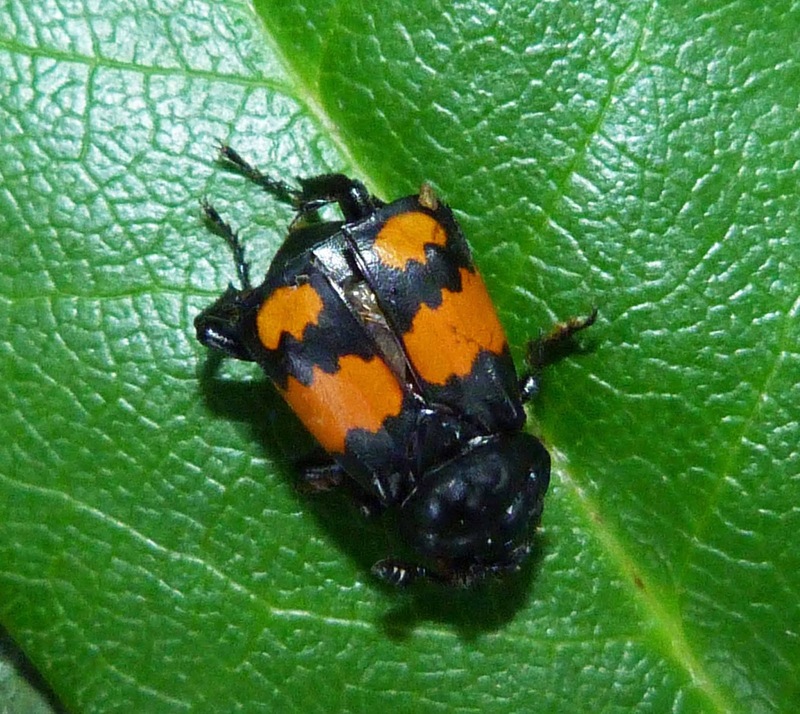 The legs are an orangey colour with black knee caps. 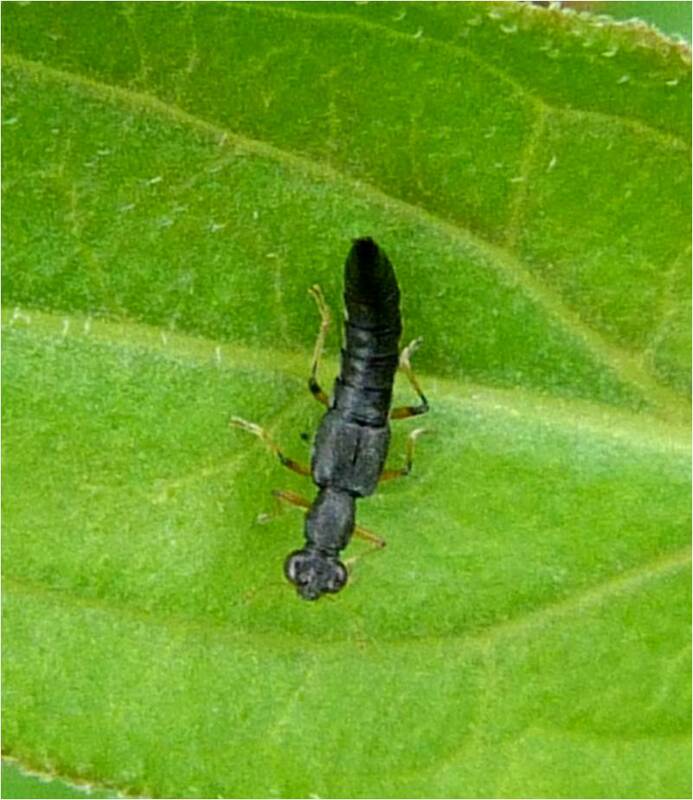 This looks almost identical to the rove beetle in the photo above, and I cannot identify either rove beetle with any certainty. 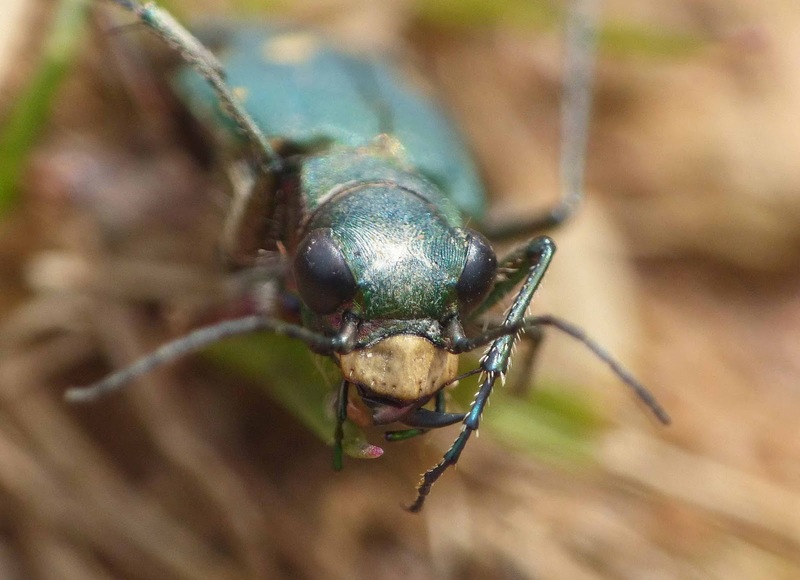 Again, this insect has the large bulging eyes of a Stenus sp. and the distinctive yellowy-orange legs with the black kneecaps. 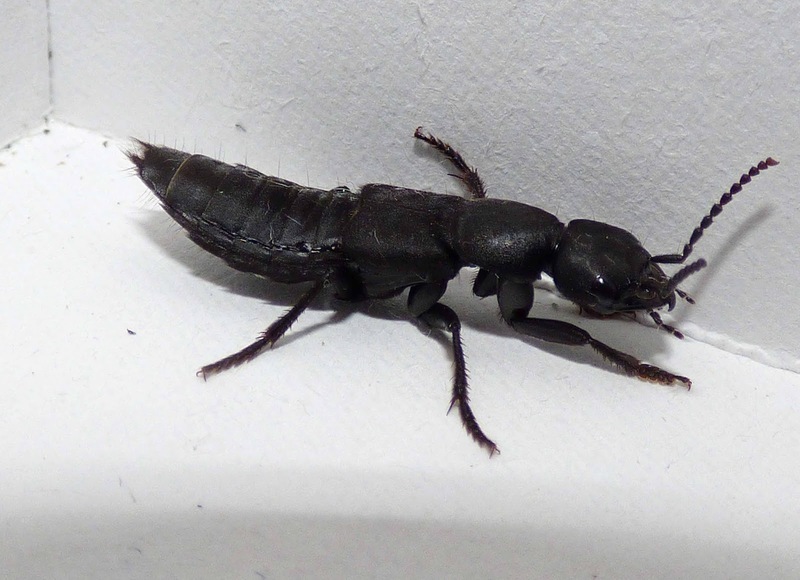 This rove beetle does look less pitted than the one above, but that may just be the lighting. In fact both species are pitted, but I think the Stenus providus is more so. 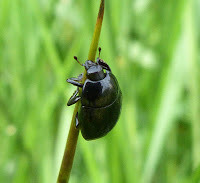 It looks like this beetle wasn't that keen on having a camara thrusted in its face from close quaters, and displayed the typical characteristic of curving in its abodmen up in defence. Whilst I know we shouldn’t have favourites, this would definitely have to me one of mine. This photo came at the end of a very unsuccessful day of insect hunting, when suddenly I saw this vision of beauty up in a tree. 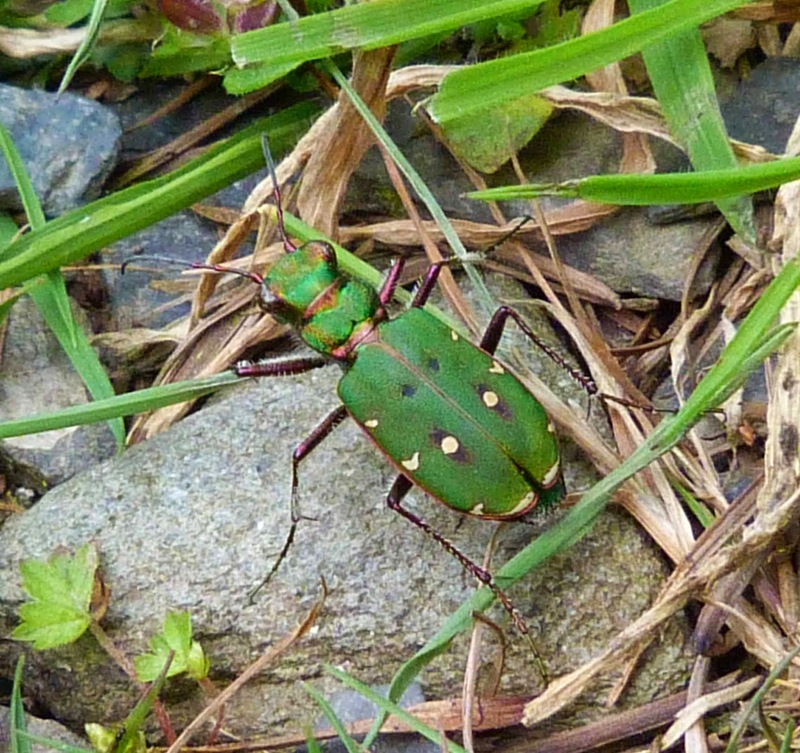 Scottish insects on the whole are not that colourful, so it’s a real treat to find something so incongruous. 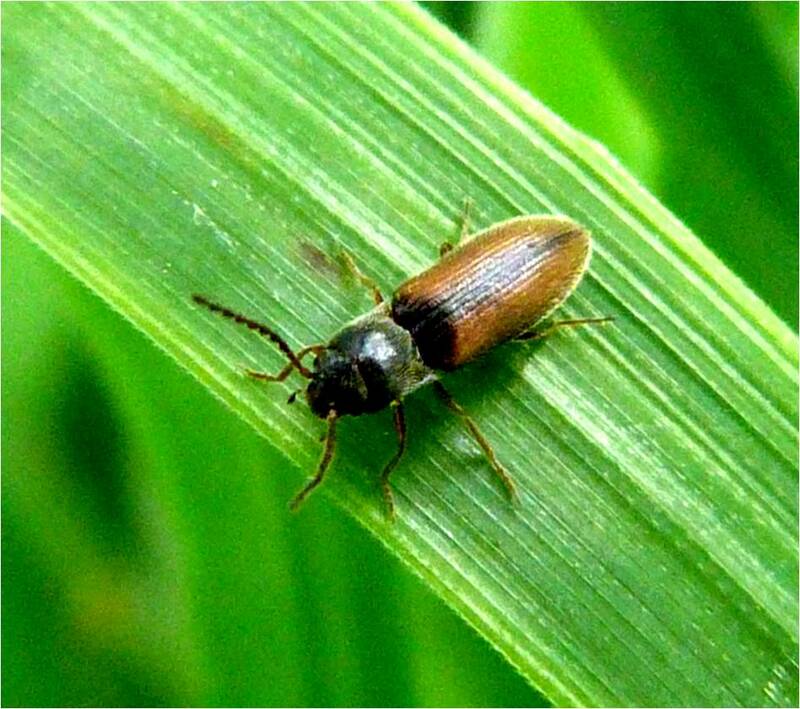 In fact, it has only recently been found in Scotland at all. These are serious garden pests, but then, what’s one man’s pest, is another man’s delight. The top photo was taken with a macro lense added to my compact camera, which I think really improves the detail. Not sure I’d be too thrilled if this was my Latin name. If these beetles fall onto their backs, they are able to right themselves by flicking their bodies into the air, which it does with a loud clicking sound. It doesn’t always work first time, but they’ll keep clicking away until they land on their feet. Whilst I’d love to see them do this, I think it’s a bit cruel to purposely lay them on their back for no other reason than satisfy my curiosity. Ok - that’s a bit pathetic, isn’t it? 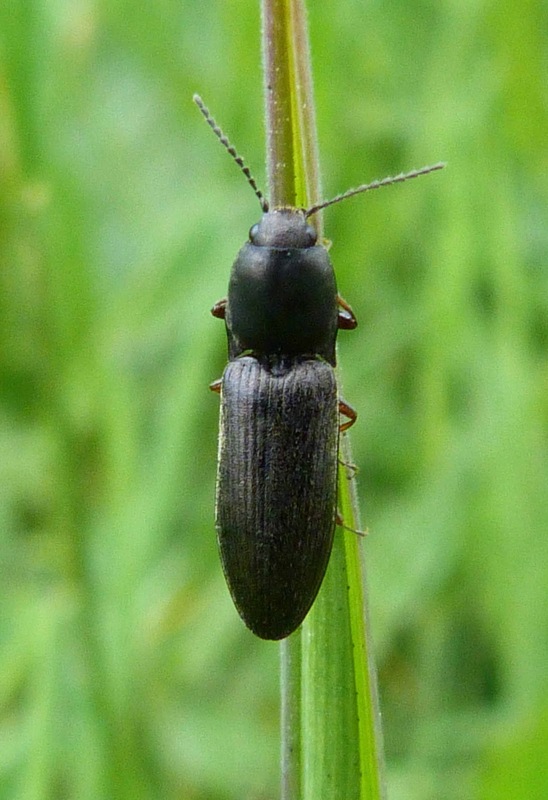 This species can be distinguished from other click beetles by it being all black, with grooved elytra and with the thorax having short hairs and a grove down the middle giving it a ‘bottom-like’ appearance. 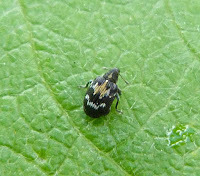 And of course, its annteanae have this beautiful feathered appearance. 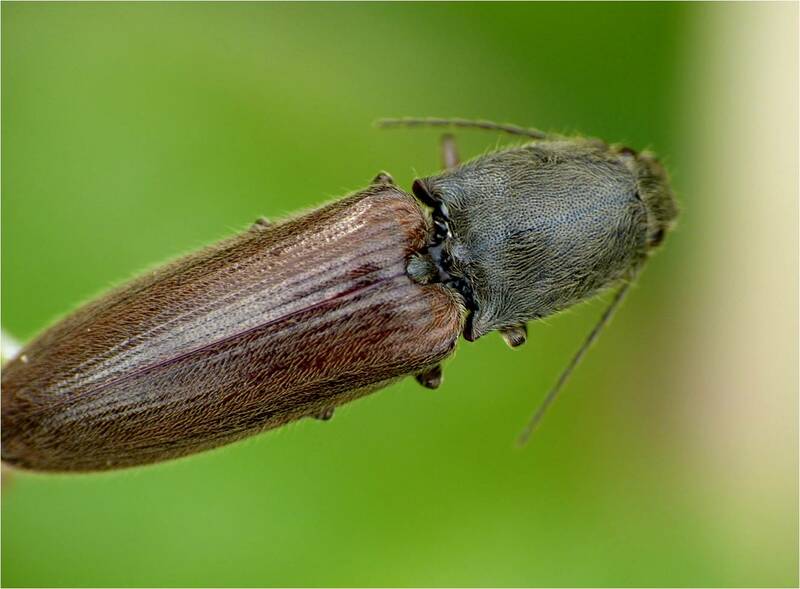 The photo on the right shows the beetle about to take flight, the protective elytra being lifted out the way to reveal the very delicate membranous wings below. 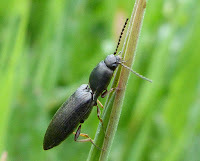 A relatively small species as click beetles go. 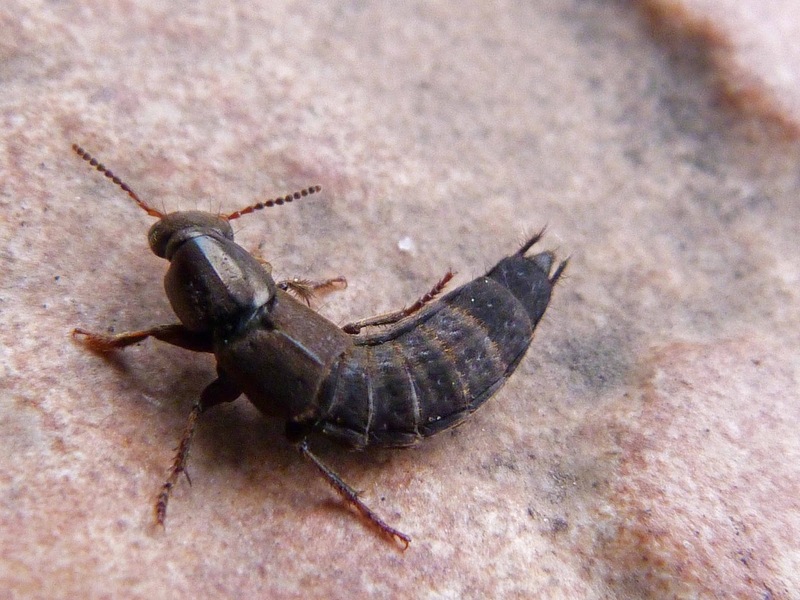 This insect is a deep orangey-brown colour with a darker brown stripe running down the centre. 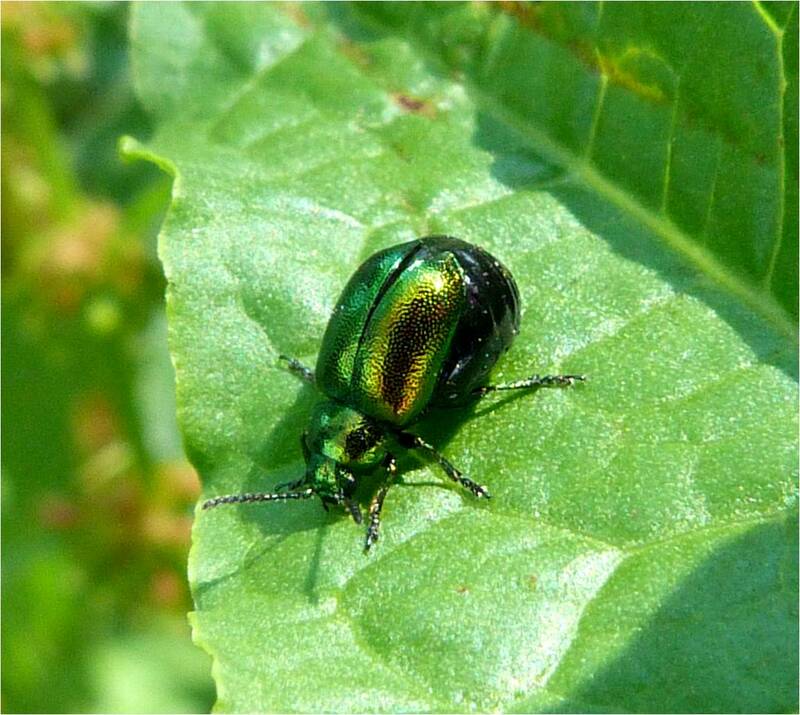 The body is covered in short hairs and the thorax on this one is particularly shiny as you can see the reflection of the clouds on it. 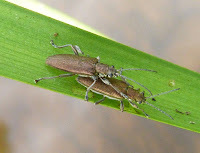 Actually, I thought these were soldier beetles at first without the usual velvety elytra, but they are in fact a click beetles. The points at the end of the thorax gave it away for me. 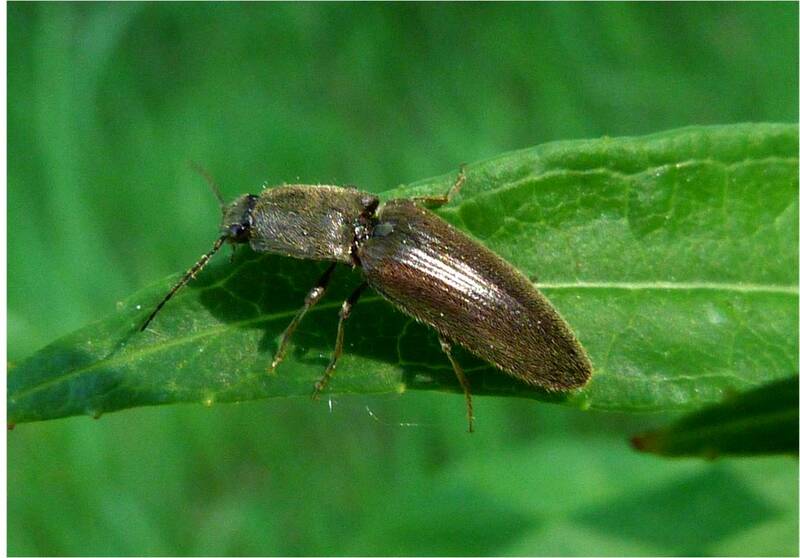 Most click beetles are dark in colour and in fact this one comes in a variety of shades, but it always has an orange thorax. The elytra on the click beetle on the left are the typical light brown and are pitted lengthways, but the elytra can be yellow, orange, grey or as in the photo on the right, black. 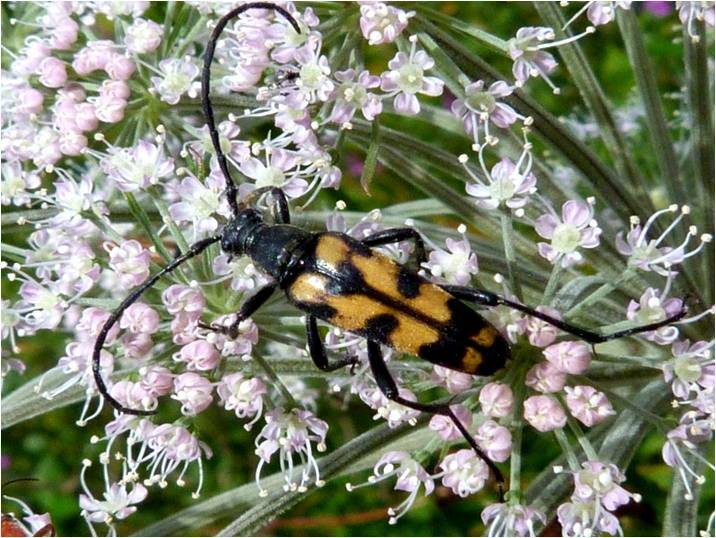 The antennae are long. 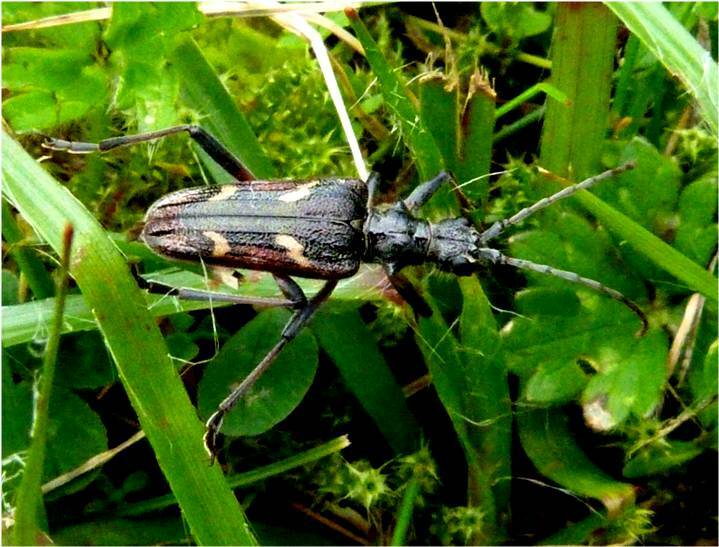 These are relatively common in England but are fairly rare in Scotland, with the black form being even more rare than the brown form. Identifying this insect was a complete nightmare and took me about a year for some reason. I still can’t understand why it’s not in any of the books as you see these wee gems everywhere. 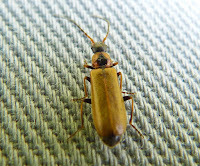 I didn’t in fact notice the beautiful orange stripe around its body until I saw the macro picture of it on my camera. There are suggestions that these are rare in Scotland, but based on personal experience, I find that hard to believe. 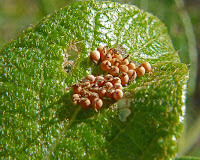 The only thing I can think is that they are tiny and hard to identify, so I’d hazard a guess that they’re just being under-recorded rather than there are simply not many of them. 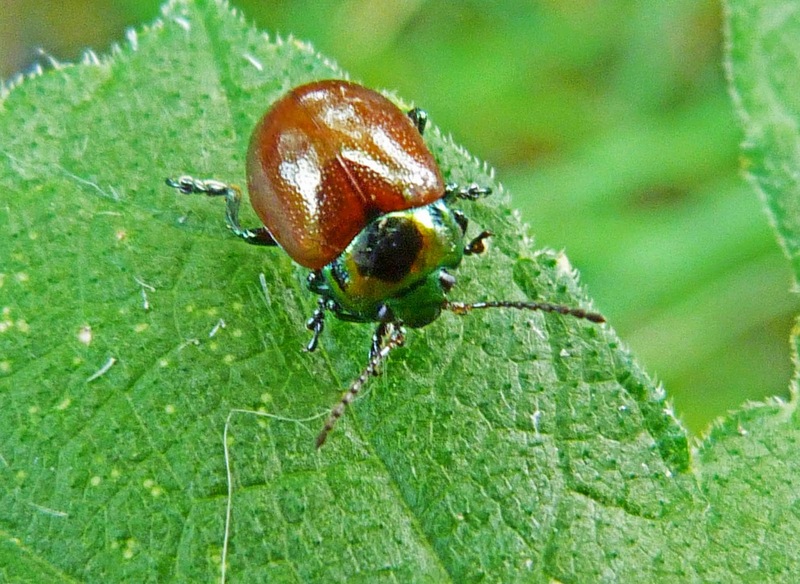 The head and thorax have a strong metallic green colour with the elytra (outer hard wing cases) having a shiny chestnut look. 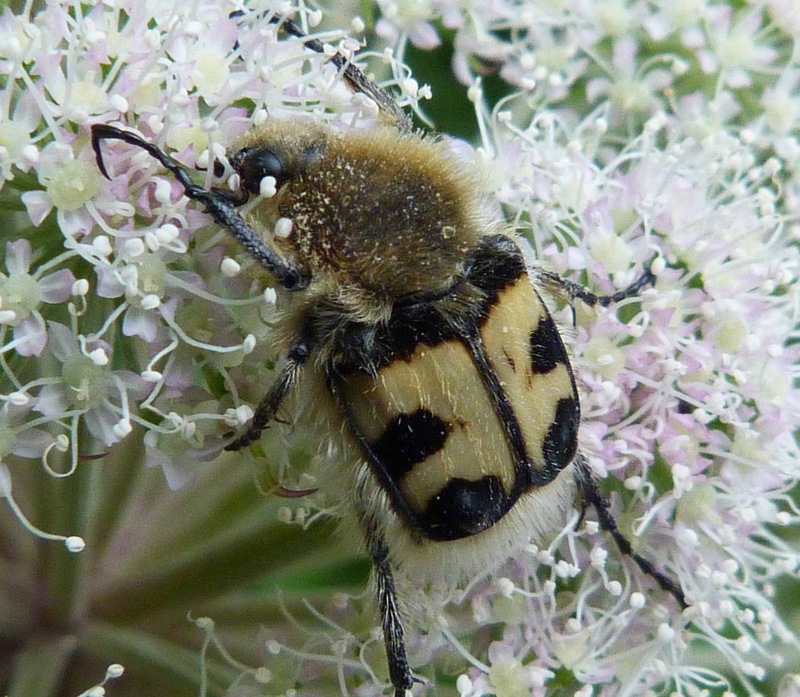 Each antennae has three flaps at the end of them. 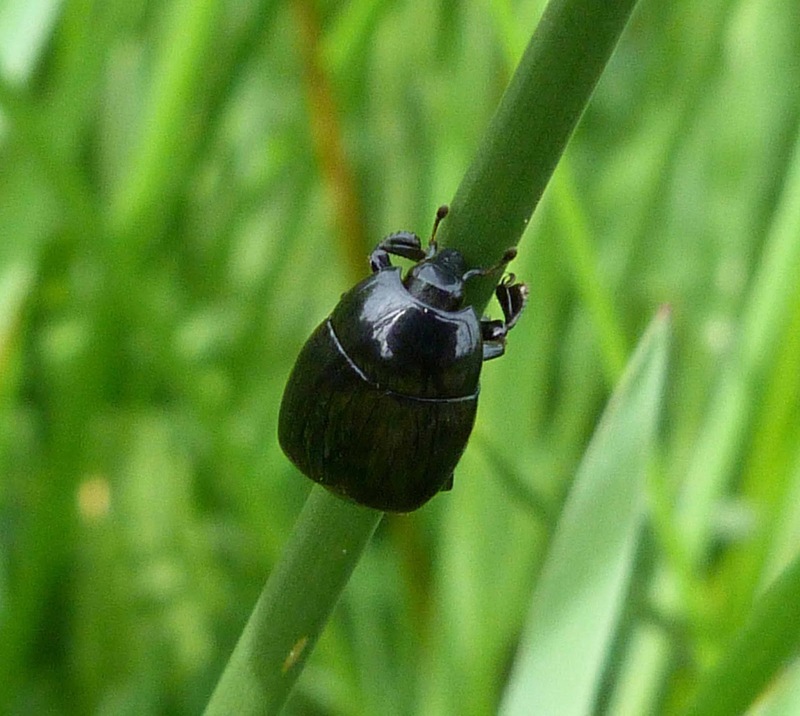 Although called a garden chafer, it is usually found in rough grass – as beautifully demonstrated here. Boy was I glad to see this fella (or gal)! I had driven about four and a half hours to Glen Affic and spent an entire day trying to find one of the elusive emerald dragonflies, with zero success. There I was heading home, miserable, when I came across this, and all was forgiven. It was absolutely stunning - genuinely. 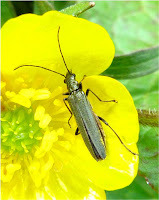 It is so distinctive, I knew what it was immediately, although it was a paler yellow than the photographs I had seen of it. Apparently, it can vary from this very light yellow to almost a deep orange. It was difficult to get any photos of its head, which was for the most part buried deep in these flowers. 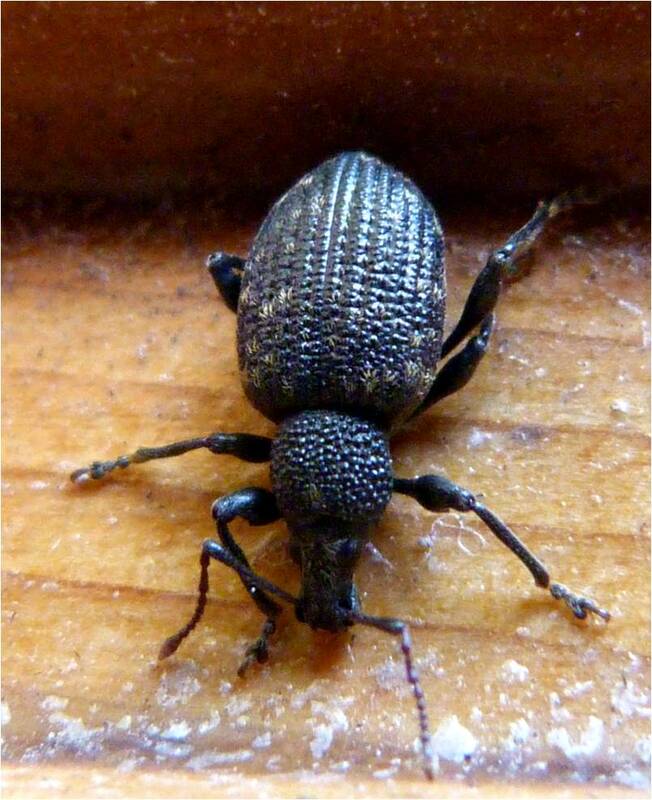 A very square looking beetle, it's body looks like it ends too soon. 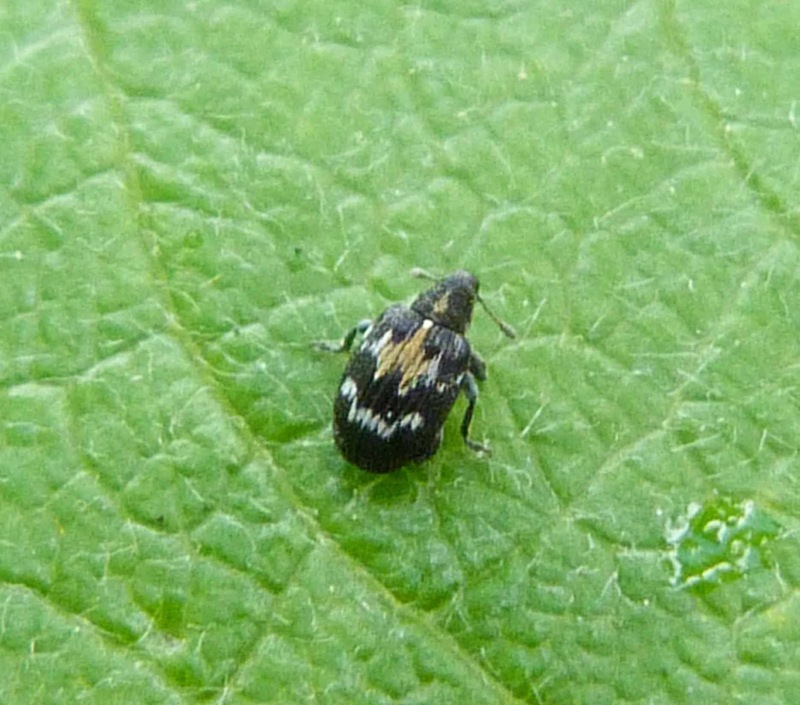 There are other species of Trichius but the markings are a bit different - in particular, this one has a solid band beneath its thorax. 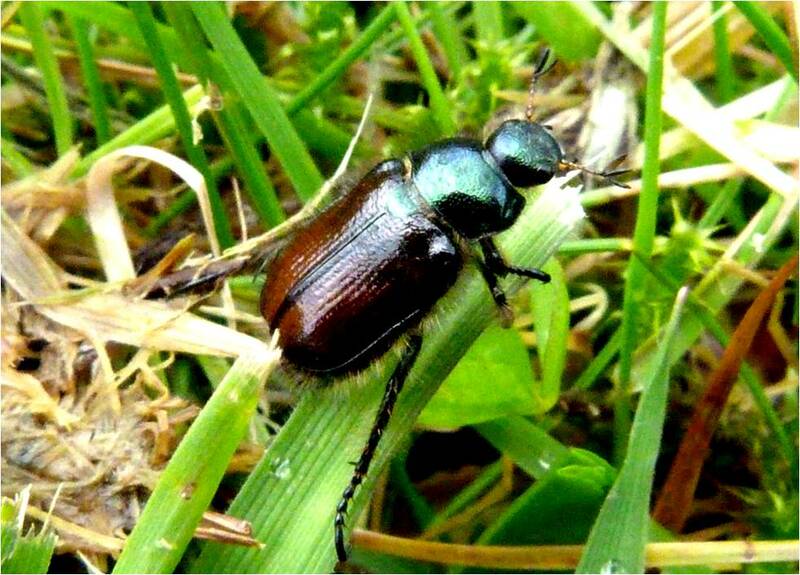 These are pretty rare and seem to be local to the Inverness region and around Wales. 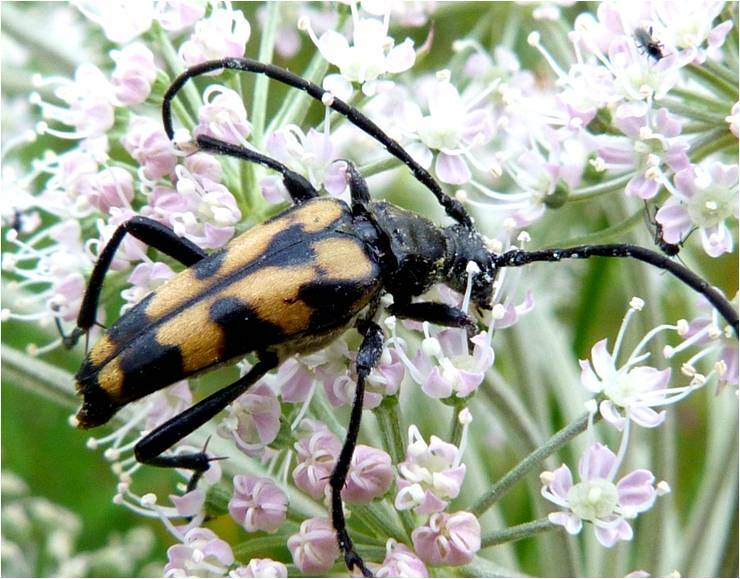 This large longhorn beetle is black with two distinctive sets of yellow ‘commas’ and reddish brown edges on its elytra. 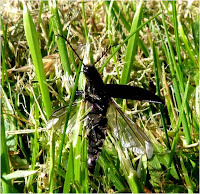 The picture to the right shows the hard outer elytra which protects the very delicate wings below as it prepares to take flight. 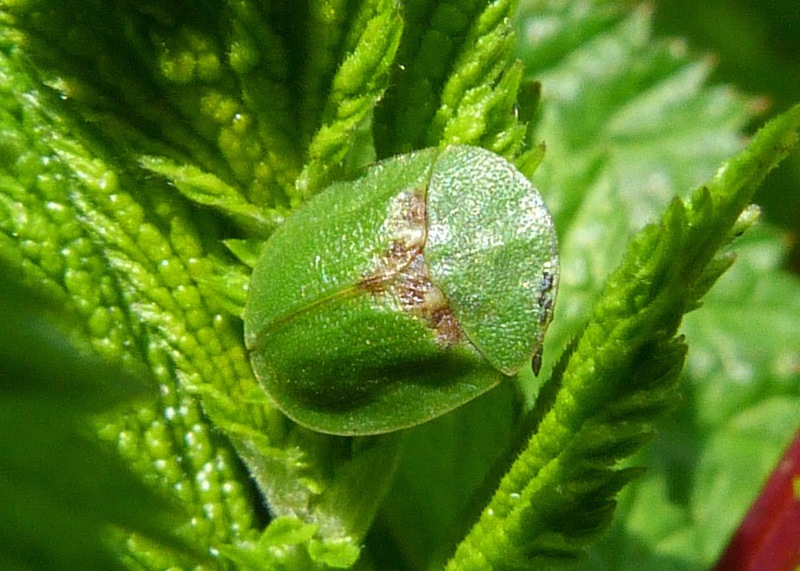 There is a sharp thorn-like protrusion at each side of the pronotum (just visible in the photo on the left). 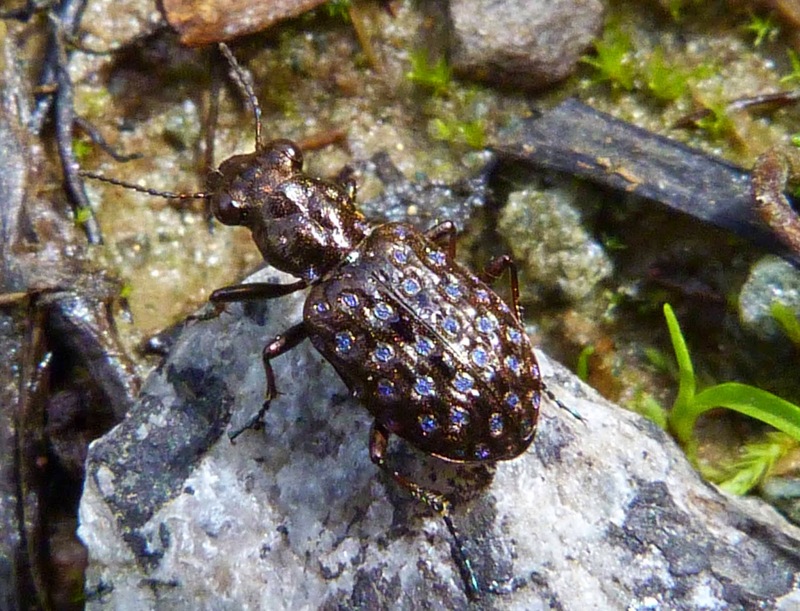 Another one of my favourites – an absolutely stunning insect – with a penchant for leopard print! 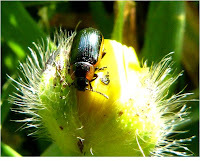 And it wasn’t at all phased by the camera – it just carried on feeding on the flower and showed no inclination to fly away, which it’ll only do if forced. 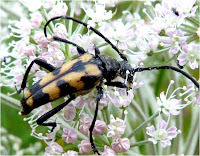 They are called longhorn beetles because of their long and prominent antennae. 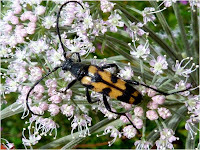 The genus seems to have changed recently from Strangalia to Leptura. 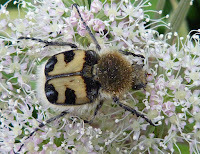 Don’t confuse it with Strangalia maculata now for some reason called Ruptela maculata which has smaller black spots at the top of its elytra and yellow legs. 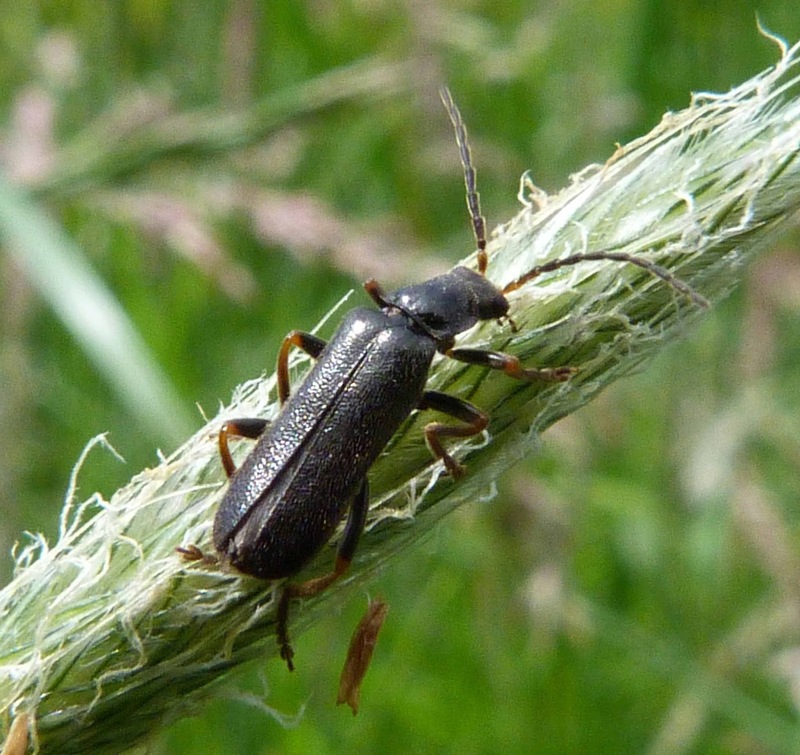 Whilst most soldier beetles have a distinctive pronotum with a dark-coloured spot in the middle of it (see photos below), this beetle's pronotum is all a shiny black as it its head. 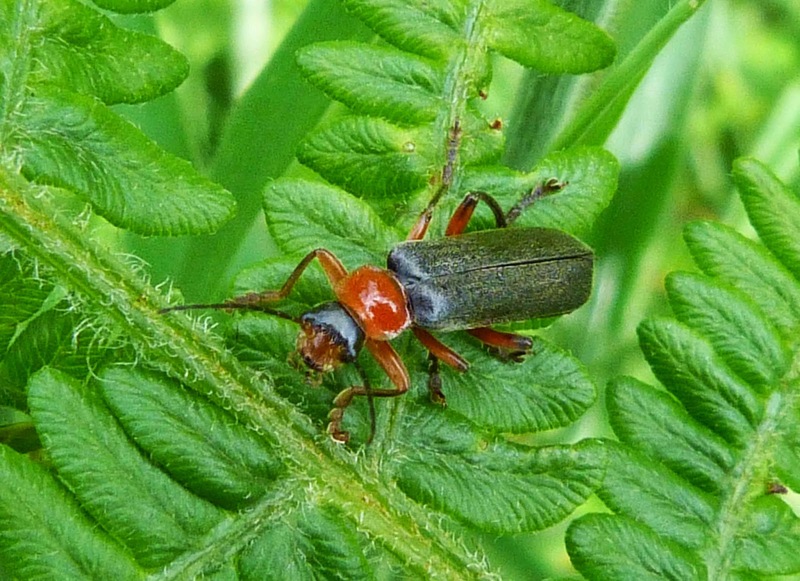 It can easily be confused with Rhagonycha limbata (below), which has a brown pronotum with a large back spot in the middle and its legs have black 'thighs'. 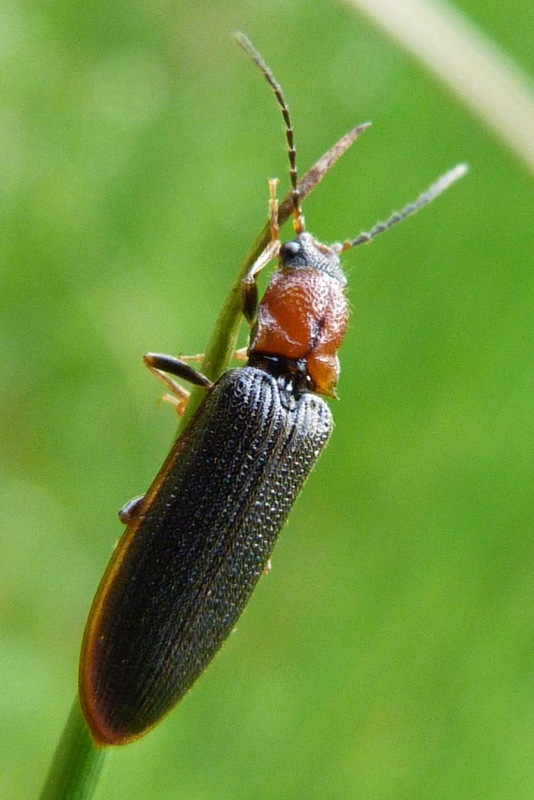 The legs of Rhaganycha lignosa, on the other hand, are entirely light orangey-brown, but other than that it is a rather inconspicuous little creature. 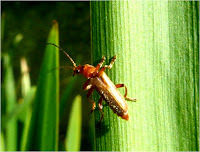 As outlined above, this beetle is similar to a number of other soldier beetles, including Rhagonycha lignosa (above), Rhagonycha testacea and Cantharis decipiens (below). This soldier beetle does, however have the distinctive black thighs of this species and an angled black spot, rather than a rounded one. It really needs someone who knows what they're talking about to tell these all apart - but it's interesting to be able to see some of these slight variations. A long and ‘furry’ light brown insect with a noticeable pronotum that looks like it’s been stuck on after the event. 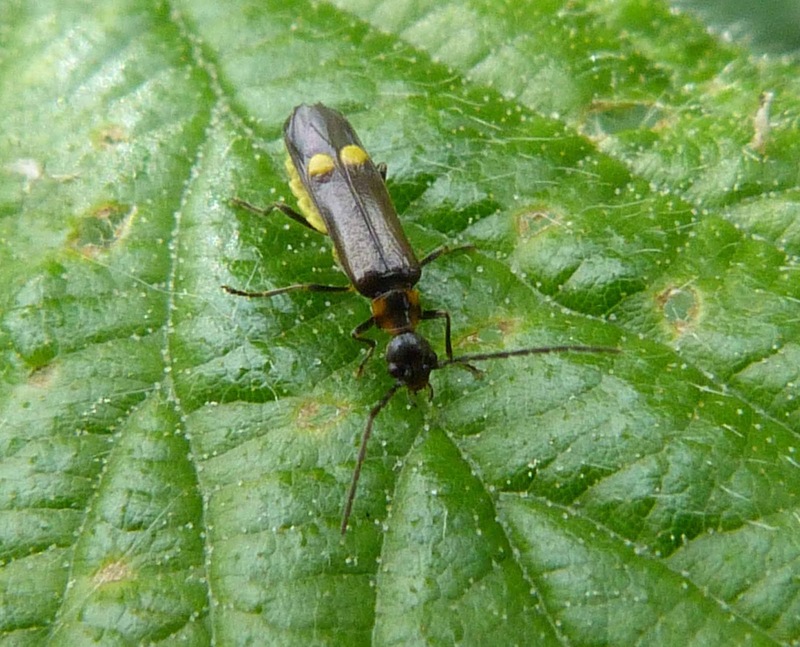 The yellow-orange pronotum has this distinctive black mark on it. 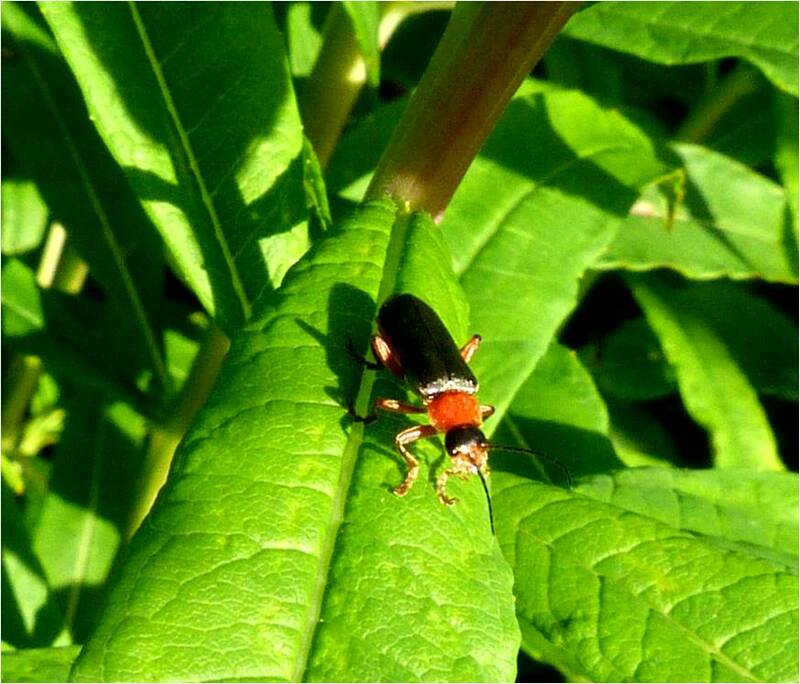 They are known as soldier beetles because they look like they’re wearing the old-fashioned soldier’s uniform (you may have to squint pretty hard to see this) . 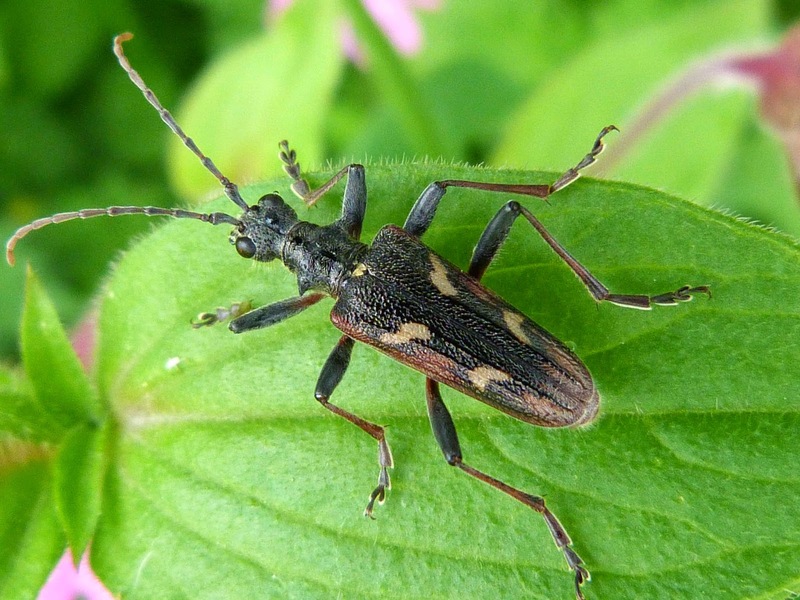 They are also known as soft-winged beetles due to their soft outer ‘shells’. 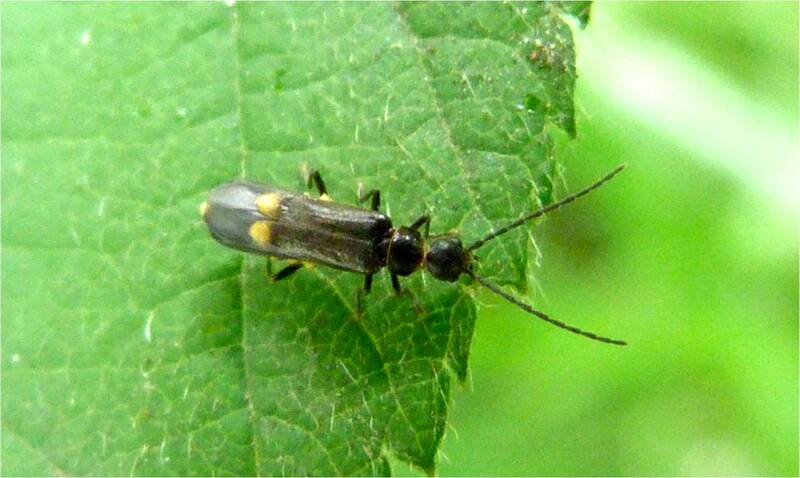 This has got the same ‘stuck on’ pronotum as the previous soldier beetle, but has black shields. 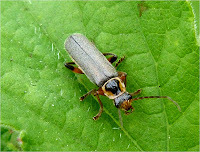 Soldier beetles with black bodies are often referred to as sailor beetles. 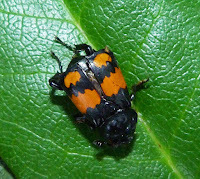 Apparently, all soldier and sailor beetles retreat to the back of leaves when a thunderstorm is brewing. However, they supposedly do this well in advance of the storm to give you plenty of time to take shelter. ‘Pigs’ and ‘fly’ spring to mind for some reason. Who said entomology was dull? 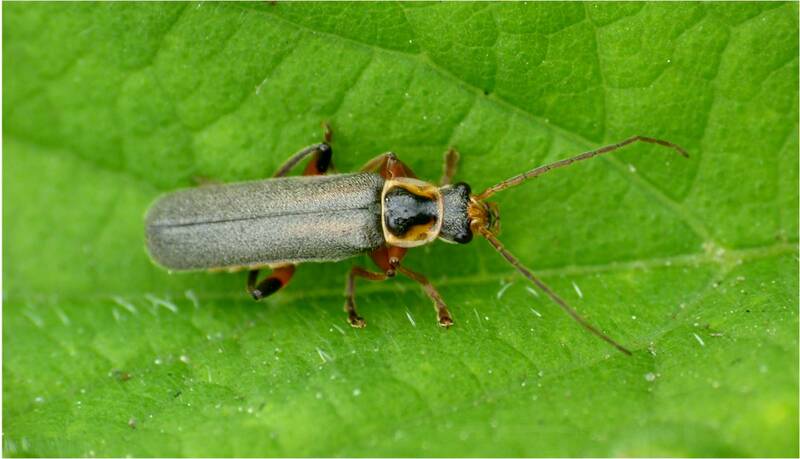 This soldier beetle has black elytra covered with short, whitish-grey velvety hairs. 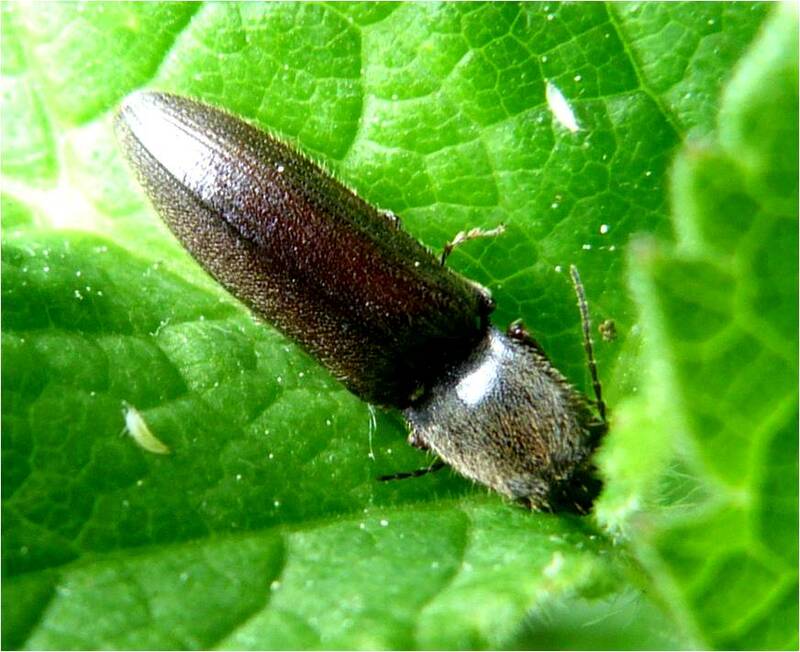 It is also known as the grey sailor beetle. 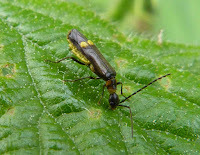 The pronotum here is yellowish with a black shiny mark in the middle. It appears, however, that the pronotum can be quite varied in colour and can in fact be reddish with now black central mark. 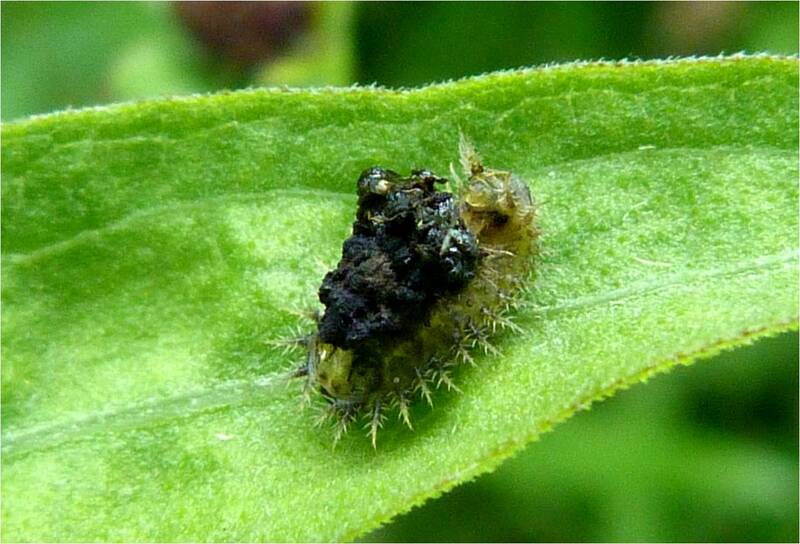 Both the larvae and the adults are carnivorous. 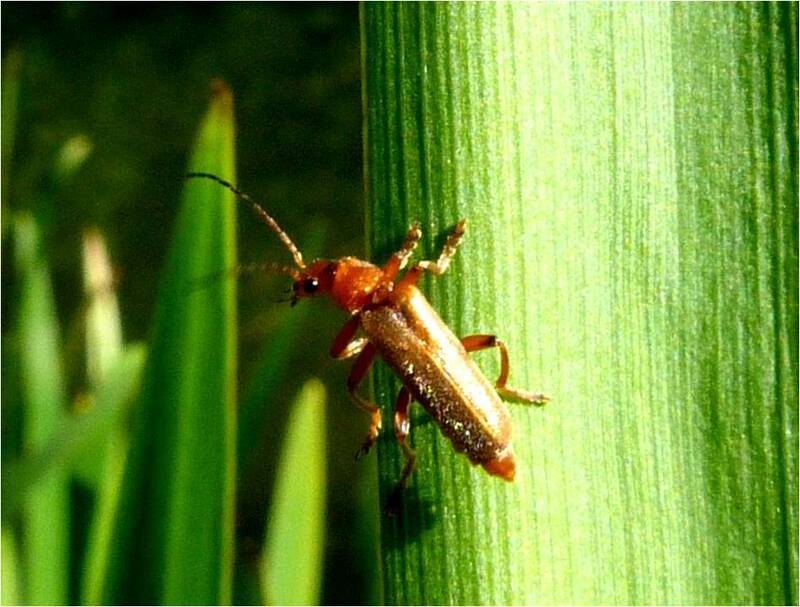 This soldier beetle is orangey-red all over except for the black marking on its wing tip. 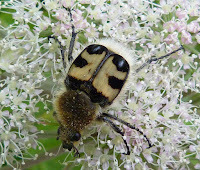 It is also known as – and for once I’m not kidding – the hogweed bonking beetle! 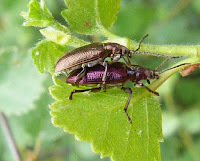 And true enough, every time you see them they’re at it, copulating like crazy, often in their hundreds, although by the look on the faces of Barbie and Ken in the middle there, they don’t much like being photographed in flagrante – just look at those scowls! 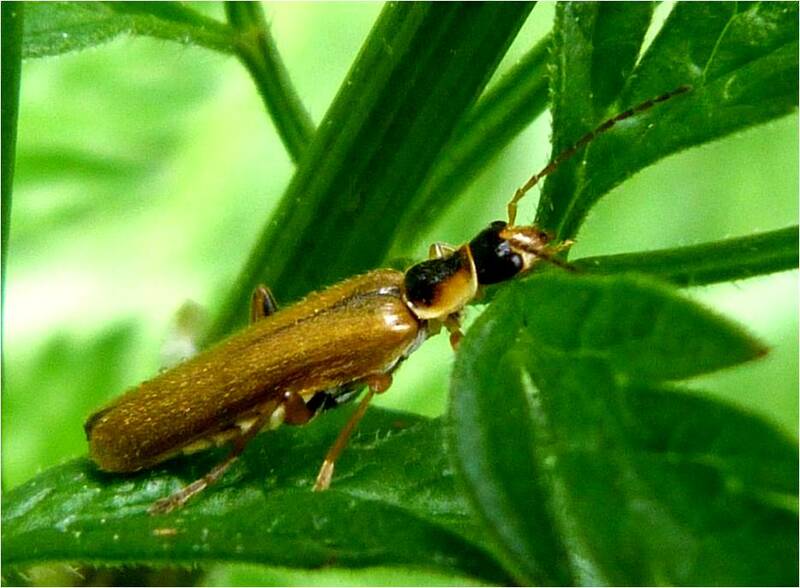 This looks very like Cantharis livida, but is smaller and lacks the black marking behind its pronotum. 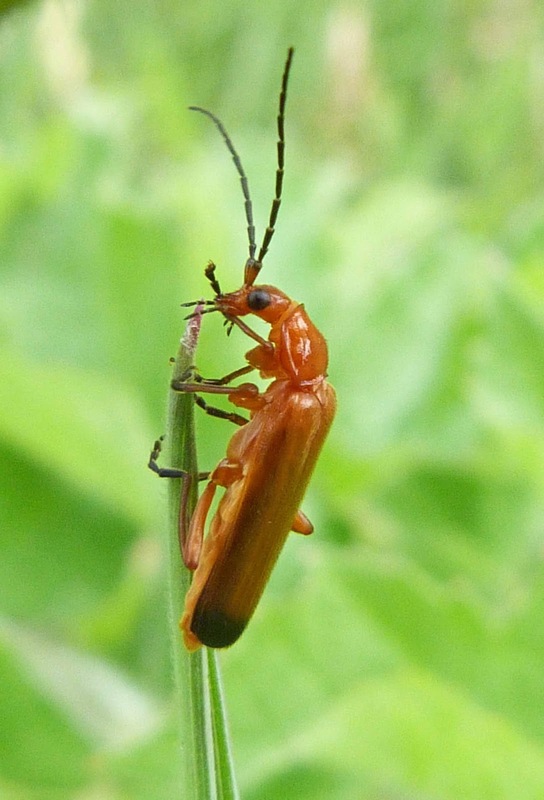 This soldier beetle can be all orange, except for its black knees. It appears that this is mainly found near costal areas in Scotland, although this one wasn’t. This is rather different from the other soldier beetles that generally have a velvety look. This one is shiny, which is caused by a layer of very fine hairs. 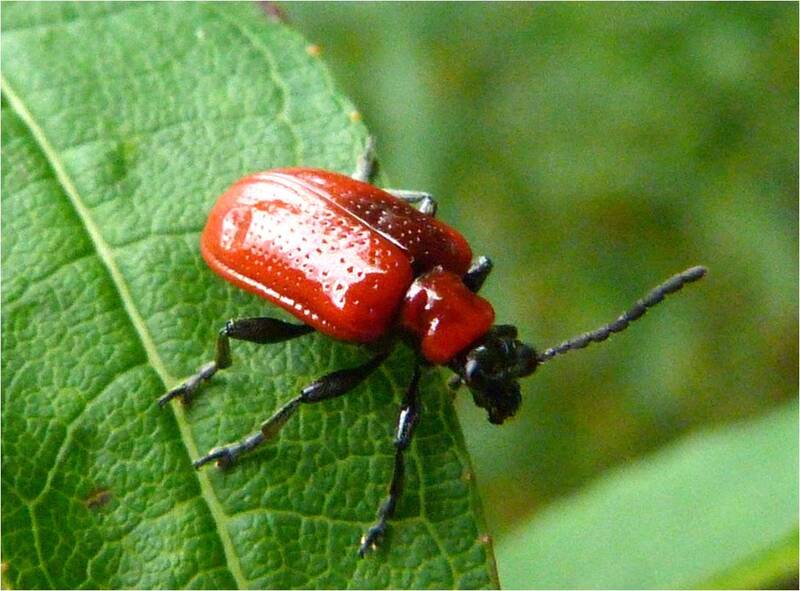 The pronotum can be all black, partly red and black or all red. The legs are always partially red. What a bit of luck – a flower beetle that is actually sitting where it’s supposed to. This is an impressive golden-greenish insect whose hard wing cases, the elytra, are split at the back to reveal the brown wings underneath. 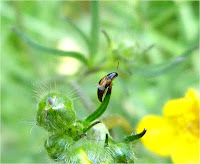 The adults feed on pollen from a wide range of flowers. 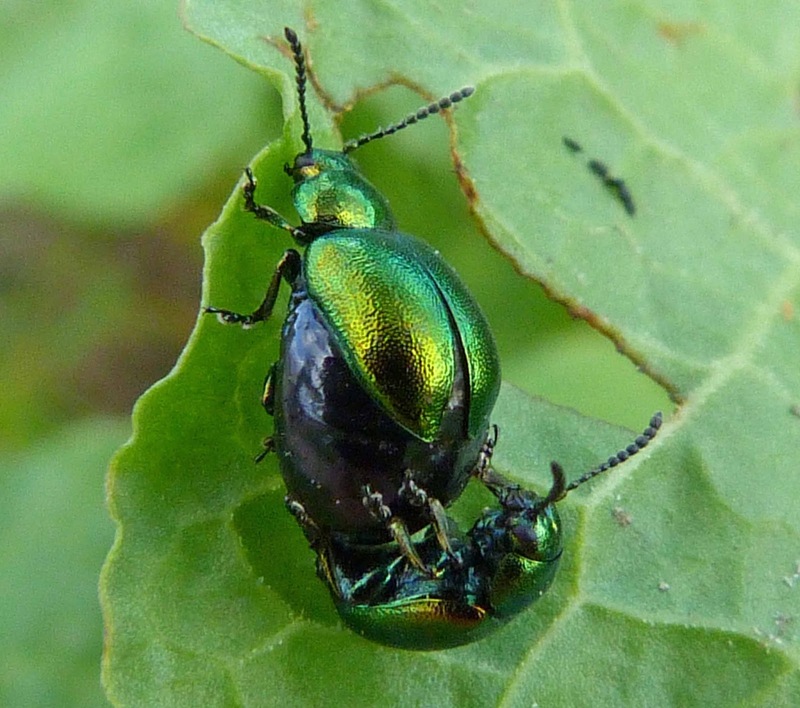 I think the flower beetle on the left is more likely to be a female as the male’s thighs are usually more noticeably swollen looking, as on the right. 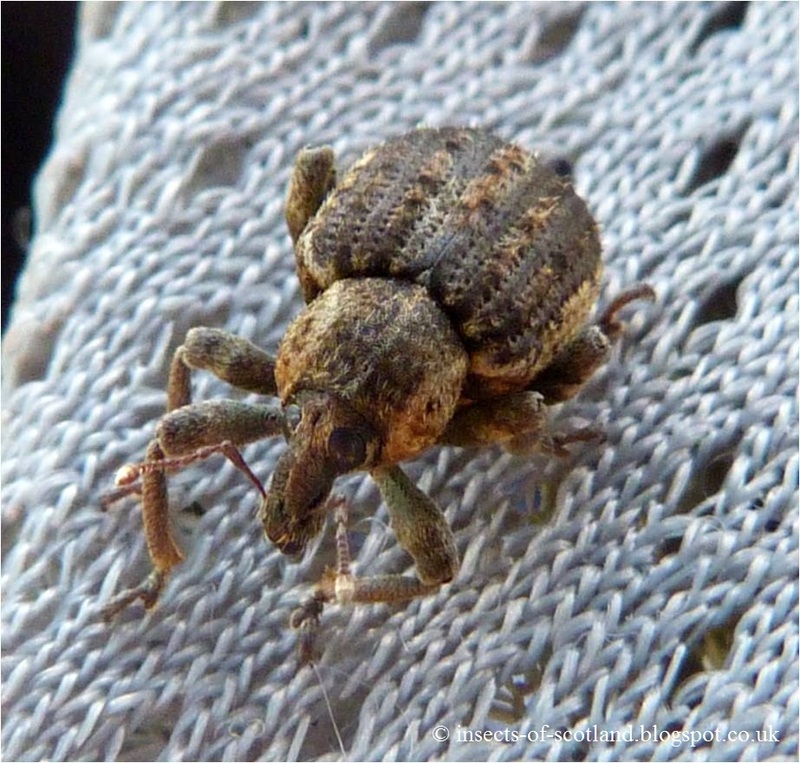 This is one of the most stunning weevils I've ever seen. 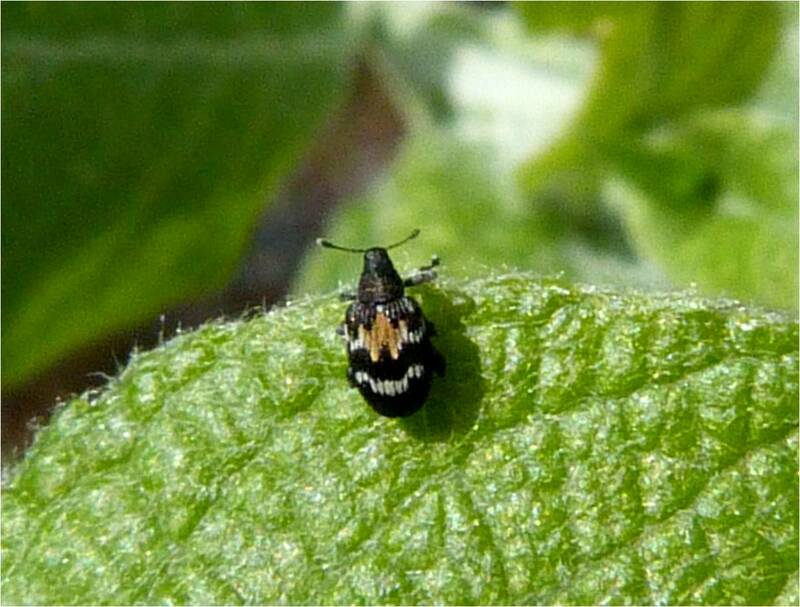 I love its long, cuved rostrum (snout) with its antennae perched precariously on top and its striped abdomen with two large black spots. It took quite some time to try and identify this weevil as there are a number of very similar looking weevils. If it is some other species, please let me know. 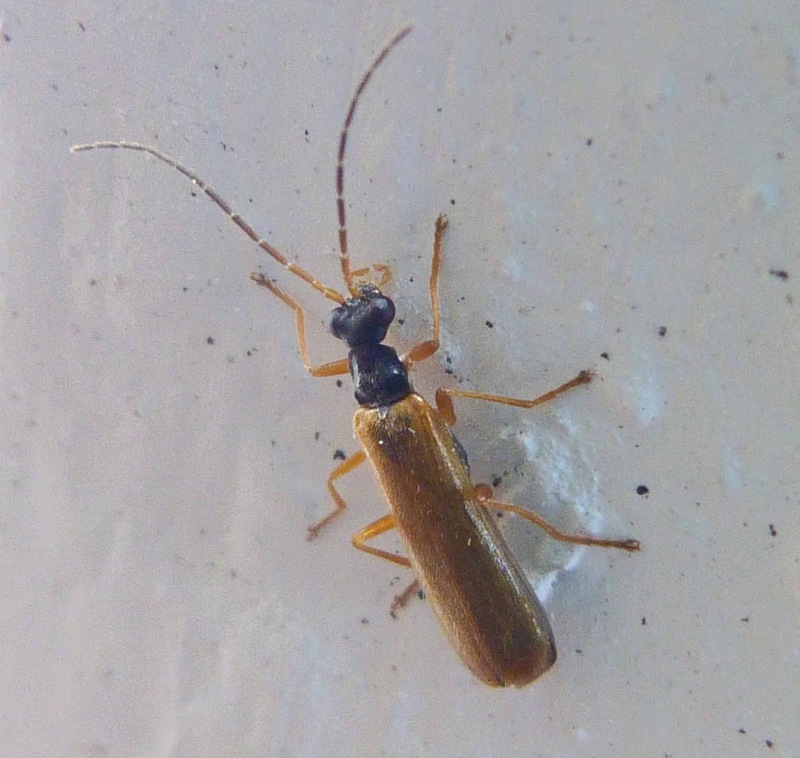 It was only in the region of 4 - 5 mm long. 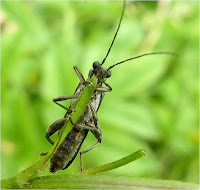 I found this one beside a pond and this detail could only be seen after I had taken a photo of it with a macro lens. Perhaps it looks like a bird dropping for camoflage. 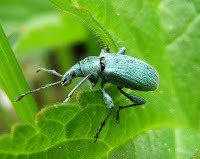 Unfortunately I only got a brief moment to photograph these weevils, but boy did they take my breath away! 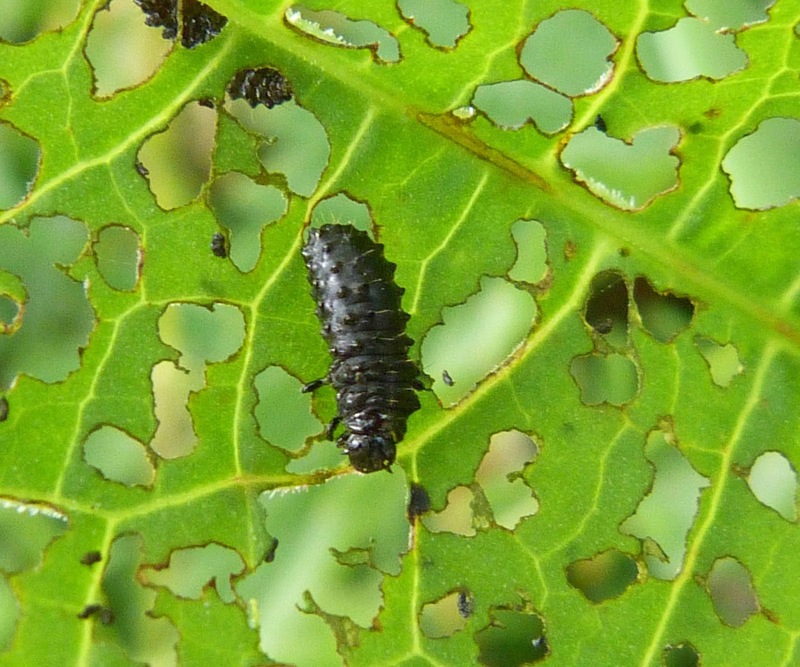 Despite being only about 2 to 4 mm, these black weevils with white and orange zigsags made them so conspicuous sitting on the leaves and so completely unexpected. From my experience, weevils do not normally look like this. The colouring is so utterly unique that I thought identification would be easy. But it was fairly hard to track this one down and there seems to be very little about it in the UK books or websites. 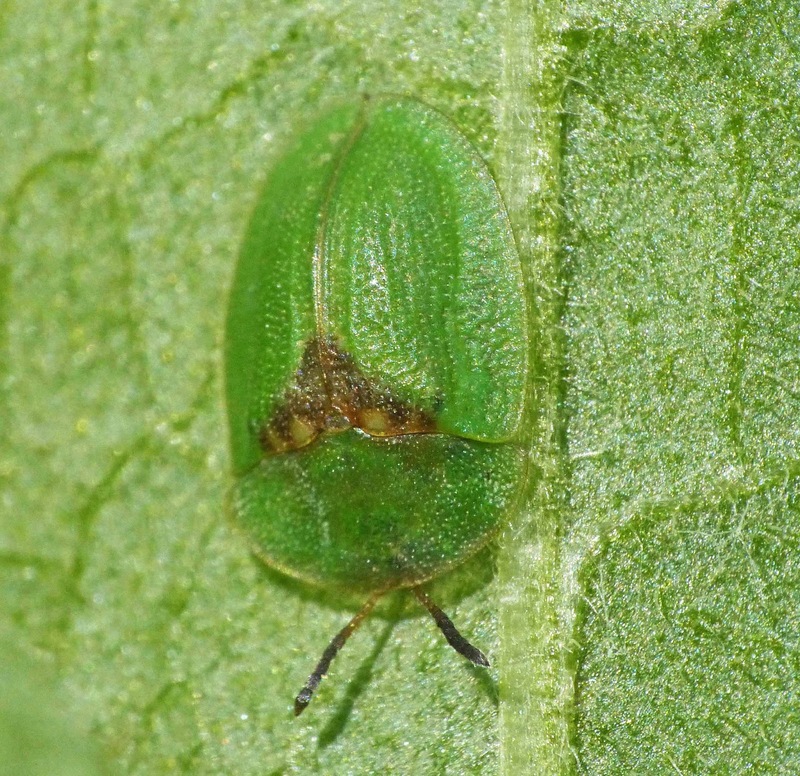 These seem to jump flea-like off one leaf and onto the next at a tremendous speed. I don't know what it is about this particular species, but without trying to sound like I've got no life whatsoever, I just can't take my eyes off it. 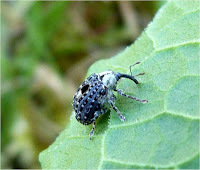 I would however love to know more about this particular weevil, so if you know anything more about it, please let me know. 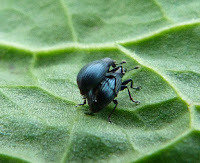 I only managed to take one quick photo of this one, before it saw me and dropped off the leaf playing dead. What did it take me for? 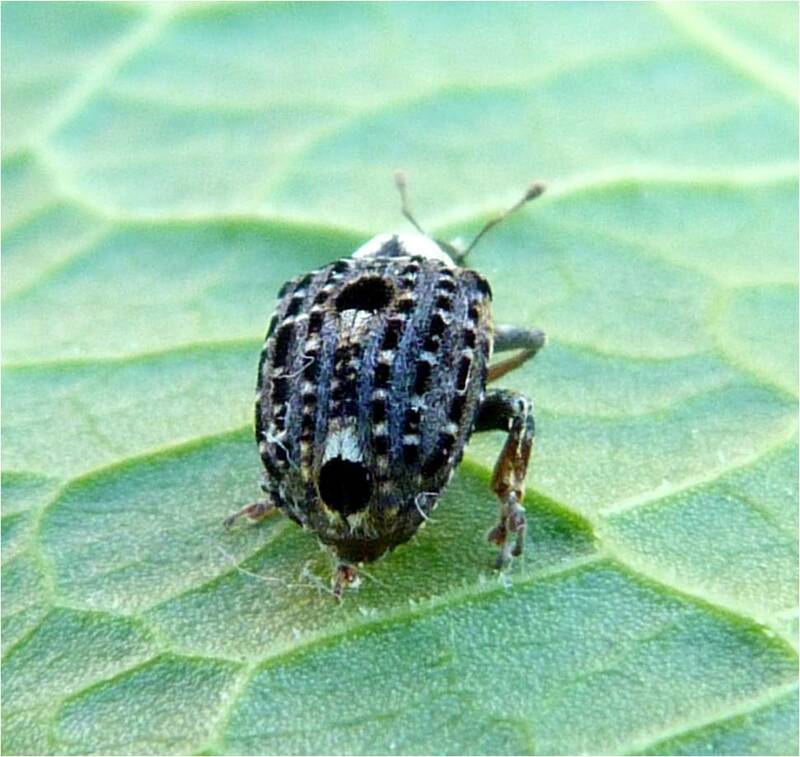 Anyway, it was very cute looking, like all weevils, and no one could dislike them, other than grain merchants. 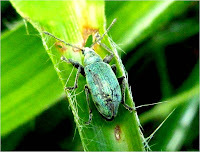 The distinguishing feature about weevils is that they have a long beak or rostrum. Many weevils are flightless because their hard wing cases, elytra, have fused together. 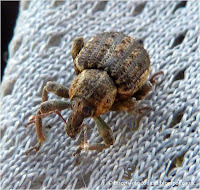 This weevil starts out with metallic blue-green scales that often rub off with time, leaving this brown and black coating. I couldn’t believe my luck finding this. A large, attractive weevil with its green-blue velvet glistening in the sun. 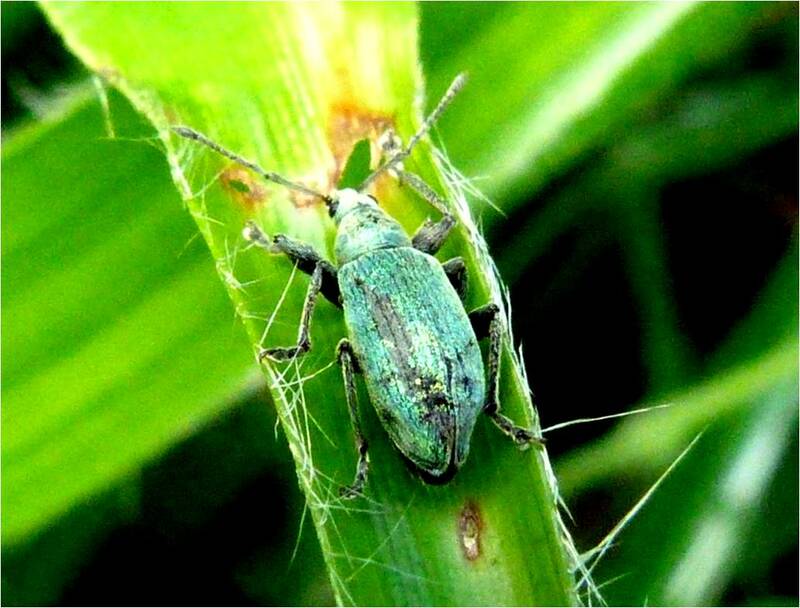 However, the green velvet often rubs off and it can look almost black – as can be seen on the weevil on the right. They can often be seen on stinging nettles. 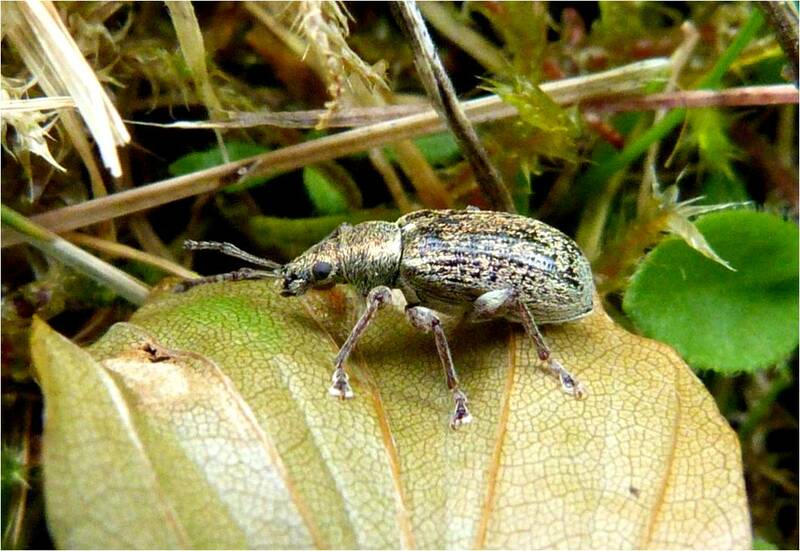 They have quite short snouts for weevils. Unfortunately, I didn’t exactly find the one in the left in Scotland but they do exist in Scotland and it was too cute to leave out. I should also point out that it was found on my mother-in-law’s jumper, although she didn’t seem as pleased to see it as I was. 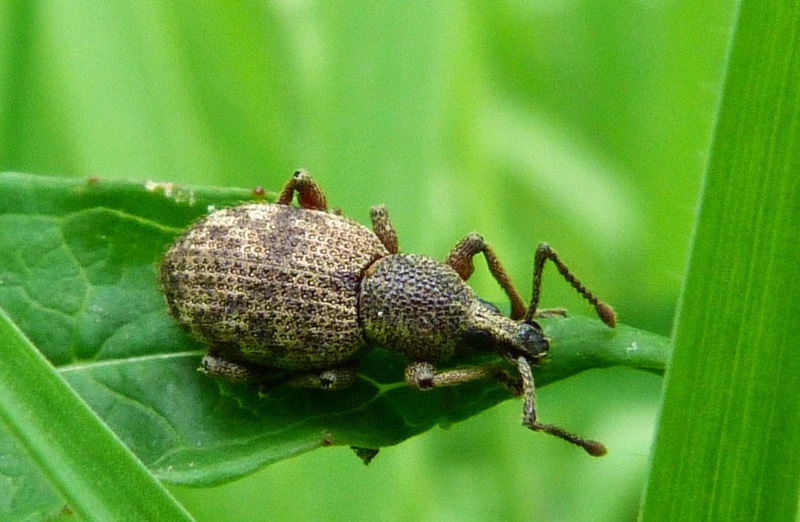 These weevils are pests of rhododendrons and of raspberry plantations particularly in east and central Scotland. 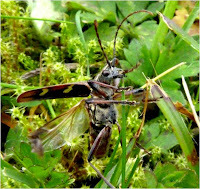 I have at last now managed to find one in Scotland, as you can see from the photo on the right - phew! 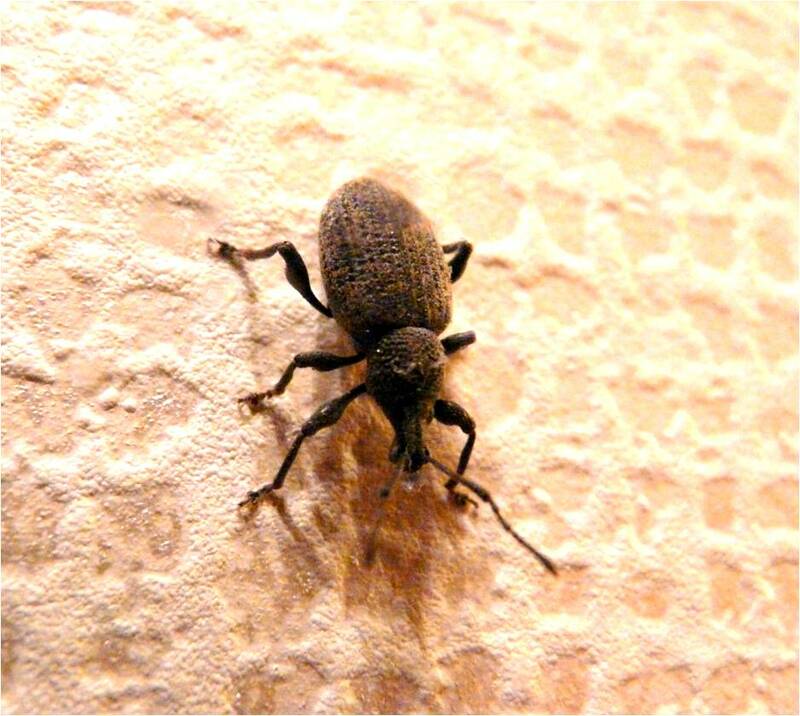 This is the first weevil I had ever seen in my life and it was on the wall of my hall – I know, pretty iffy wallpaper… But they have been known to sneak indoors in the colder weather. 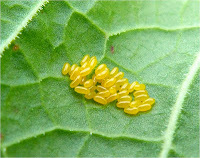 Both the larvae and the adults are serious garden pests, but they’re always welcome in my garden. It is a black beetle speckled with brown patches and the bottom of their legs are ‘toothed’. I managed to get a slightly better picture when I spotted one on my mother-in-laws front door! An enormous water beetle which is all black except for it reddish-brown legs and antennae. 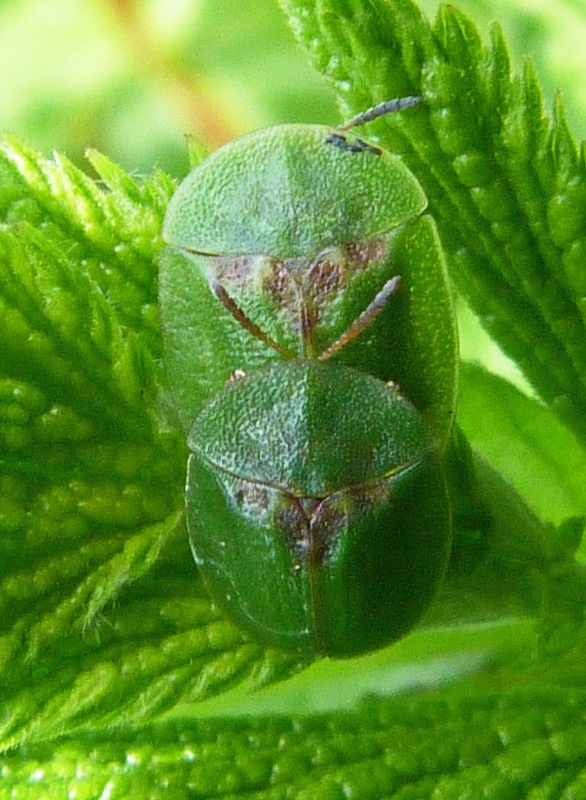 The head, thorax and abdomen look like their all glued together giving this the appearance of not having distinctive body parts. Perhaps this is so that it is hydronamic as this is a carnivous beetle which hunts small aquatic creatures both in and on top of the water. 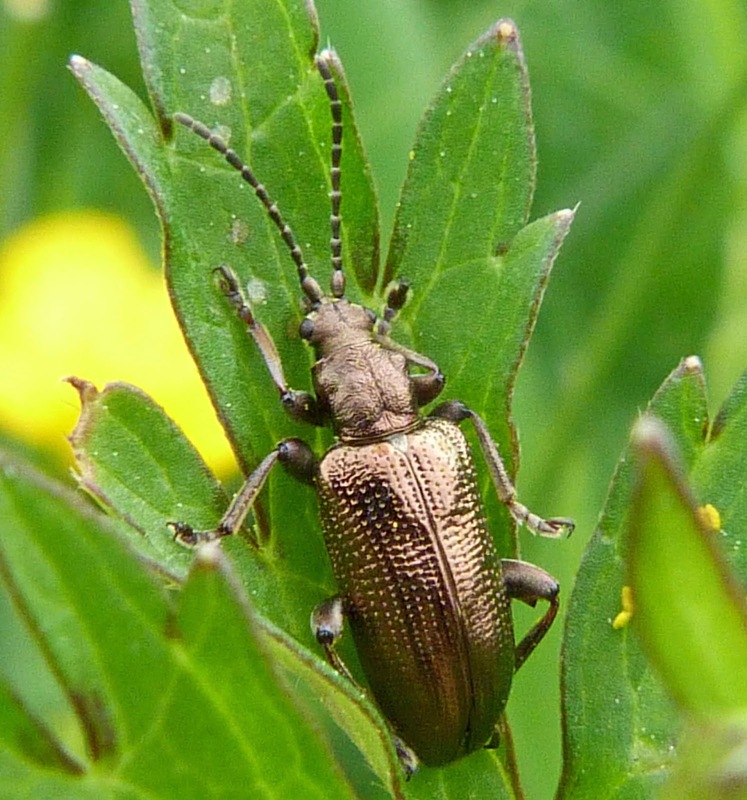 This is supposely a very common beetle, although after many years of insect hunting, this is the first and only one I've ever found. 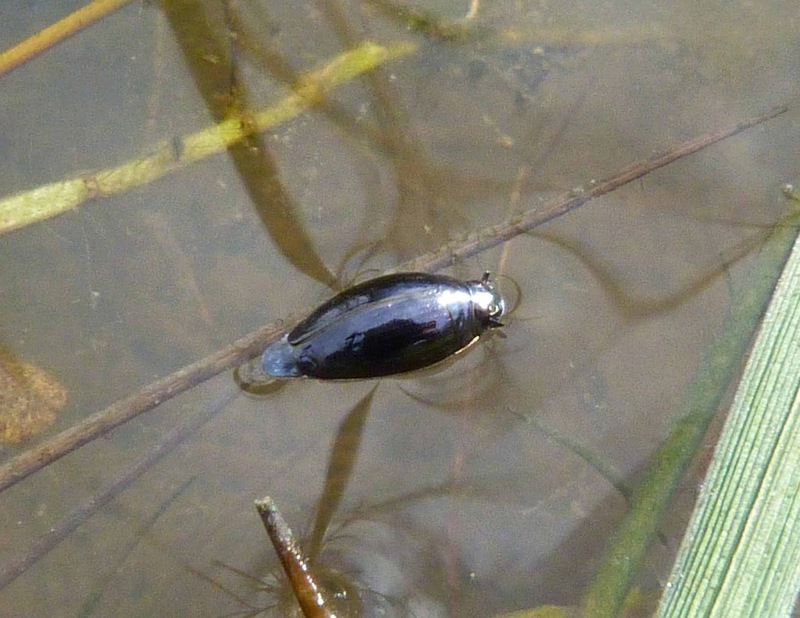 There are a few species of whirligig beetle in the UK, but as this is by far the most common, I think it's most likely to be this species. And thank goodness for electronic photos. 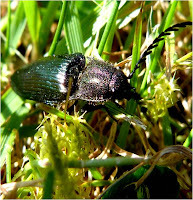 This has to be the most impossible insect in the world to photograph and I have many, many blurred photos of this beetle to prove it. It should have been easy, there were about twenty of them in a small puddle, but as the name suggests they whirl around rapidly on the surface of water in all sorts of random directions and to be honest, when you do finally manage to get one in focus, it's hardly worth it - a plain, black, shiny beetle, with no distinguishing features. Apparently, however, each eye is split into two, with one looking across the surface of the water and the other below the water. Maybe that's what causes it to swim around incessantly like a maniac.